I knew this day would come: an invite to a birthday party on the eastside. 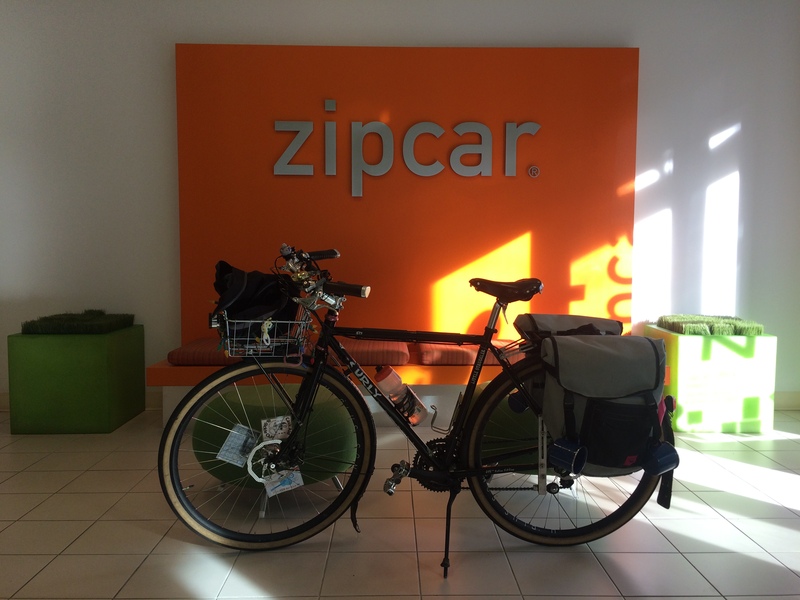 I used to dread this day, but having used Zipcar once last winter I realize we’ve got an option for the rare trips to places too hard to reach by bike and/or transit. Before reserving a car I thought I’d have a laugh and see just how impossible it’d be to take buses to SkyMania indoor trampoline park. I always use Google maps transit directions for bus suggestions, but if you like something better, please let me know in the comments section at the bottom of this post. 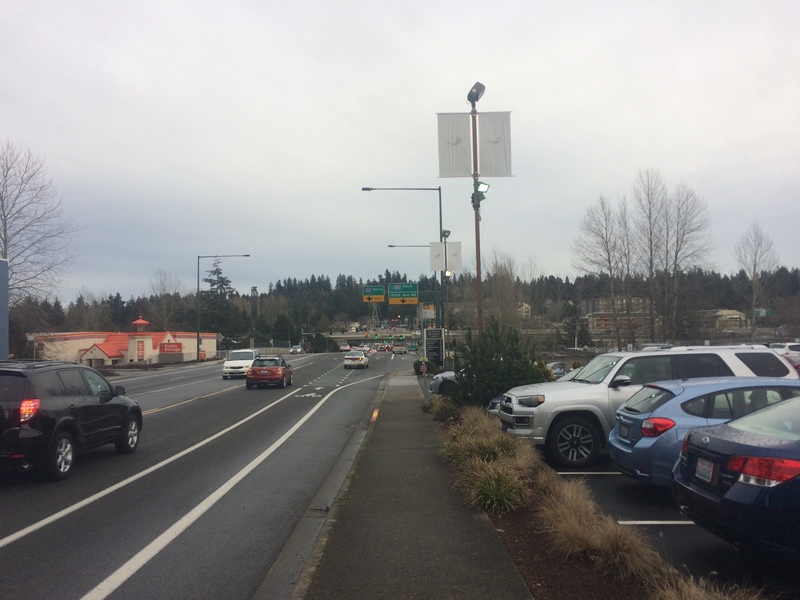 Three buses over an hour and a half with nearly a mile-long walk at the end sounded horrible (especially the walking in a non-walker-friendly city), but I couldn’t help but notice how close SkyMania sat to the Cross Kirkland Corridor. 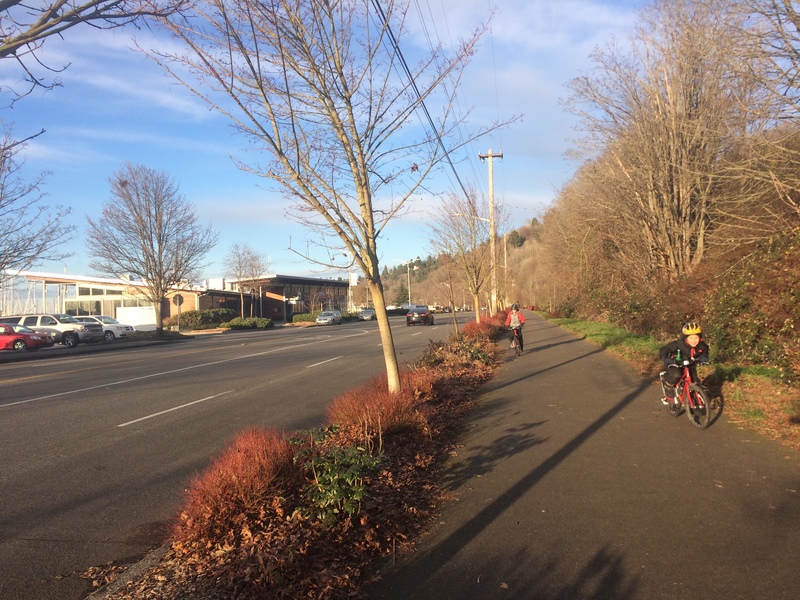 I remembered reading about the trail on Seattle Bike Blog: Kirkland’s new trail changes everything. The third of the three buses, King County Metro Route 255 had a stop less than two miles from our house and many stops near the Cross Kirkland Corridor so bike-bus-bike could work after all! Now just routing us there isn’t planning enough, big trips like this must include eating stops and it’s not exactly picnic weather. I poked around the map to see if there was food to be found along the Cross Kirkland Corridor, but I didn’t see anything perfect so I took to Twitter to ask @CrosswalkView, a family of six with a blog about family biking and walking in Kirkland at The View from the Crosswalk and @GlenBikes who lived in Kirkland before he moved to my neck of the woods and still knows everything about bicycling there. 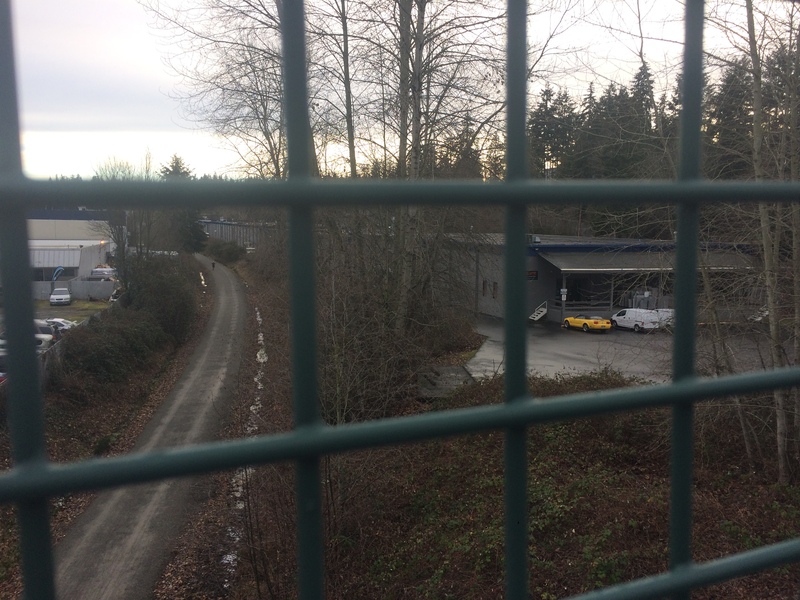 My suspicions were confirmed that there’s not much around the CKC, but I got some good advice if we wanted to leave the trail for Houghton Plaza: The View from the Crosswalk: Connecting the Eastside Rail Corridor part 3: Houghton. 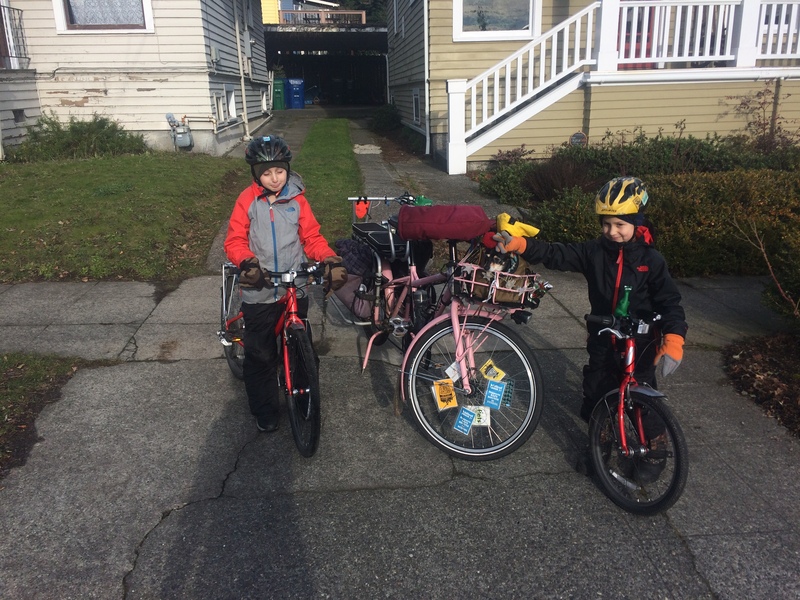 I rode the old mamabike with my seven-year old in the Bobike Junior rear seat and my nine-year old rode his own bike. 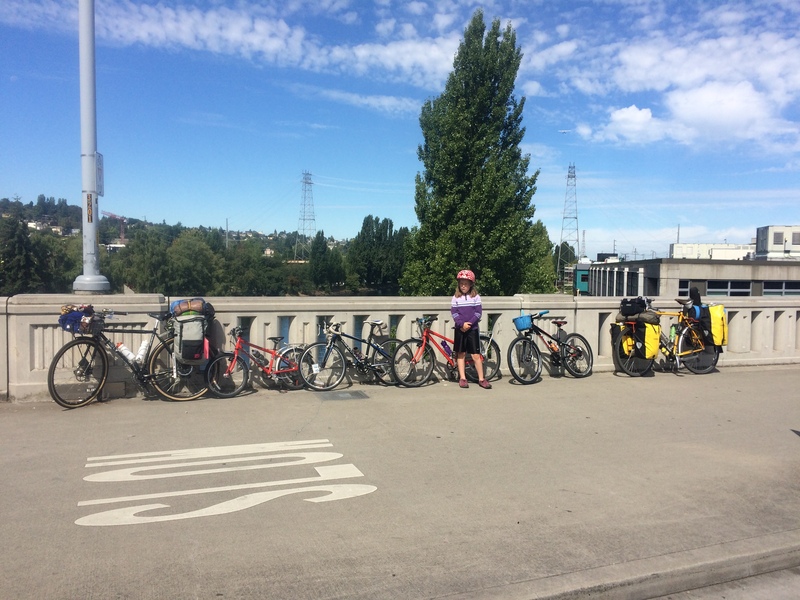 It was tempting to take three separate bikes because Metro buses all have three bike slots (whereas some Sound Transit buses only have two), but I figured it’d be best to keep it simple. It worked great! 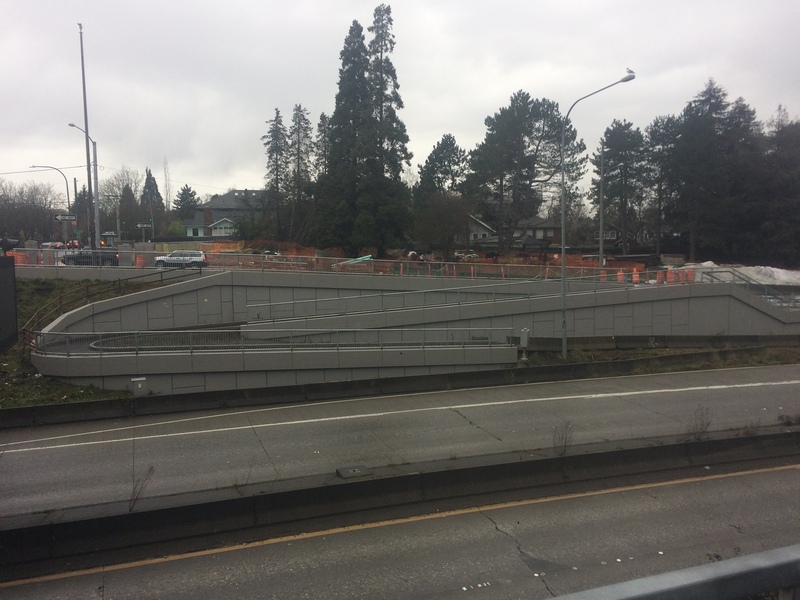 The 1.7 miles to the bus stop was flat except for the two downhill blocks to get from home to the Burke-Gilman Trail and the ramp by the UW light rail station to get down to the Lake Washington Loop from the Burke-Gilman Trail. And 35 stairs to the bus stop (I carried the bikes one by one). 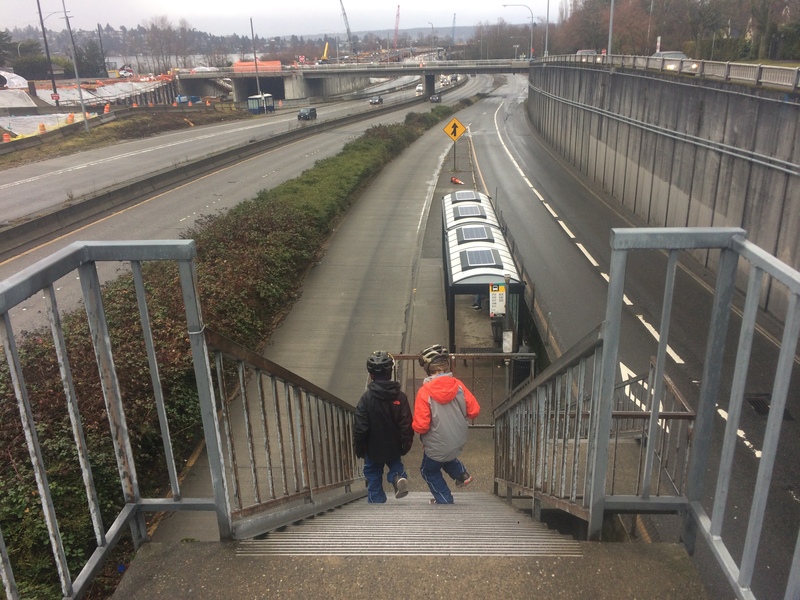 I was dismayed to discover the South Kirkland Park and Ride is on the side of a hill, but it was OK this one time and we can use a different bus stop in the future. 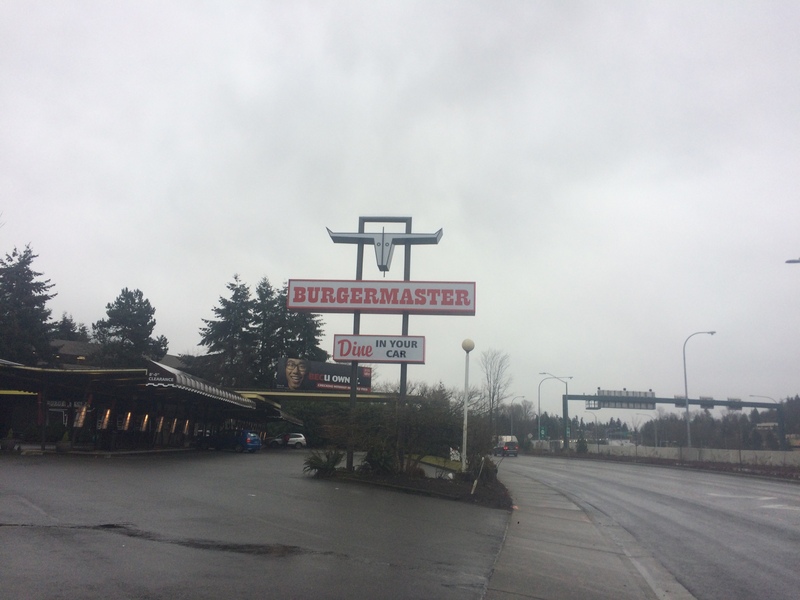 The short ride to Burgermaster wasn’t bad–we cut through the parking lot of a La Quinta Inns & Suites and approached via the sidewalk…and immediately realized Burgermaster (like most of the eastside?) is designed for people in cars. 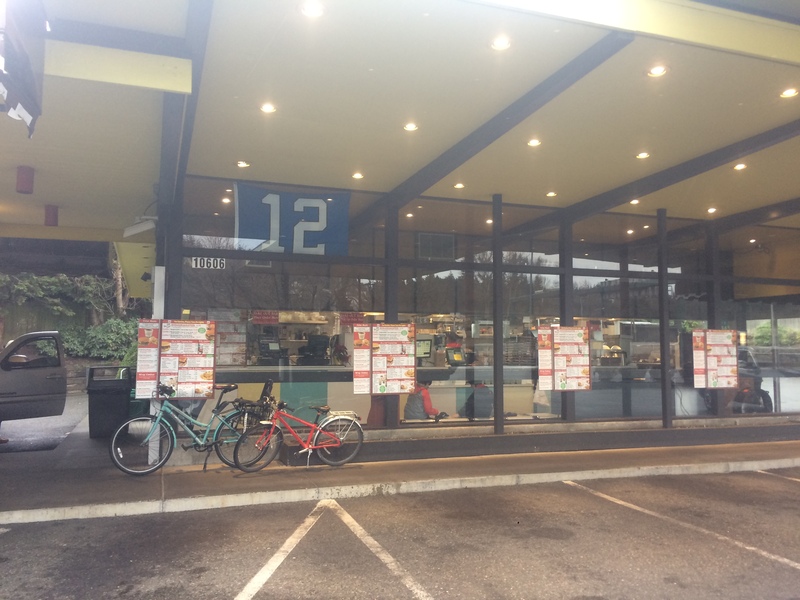 One drives up, chooses a parking spot in front of a menu, and orders through rolled-down window to a server who has walked over from the seating-free building. 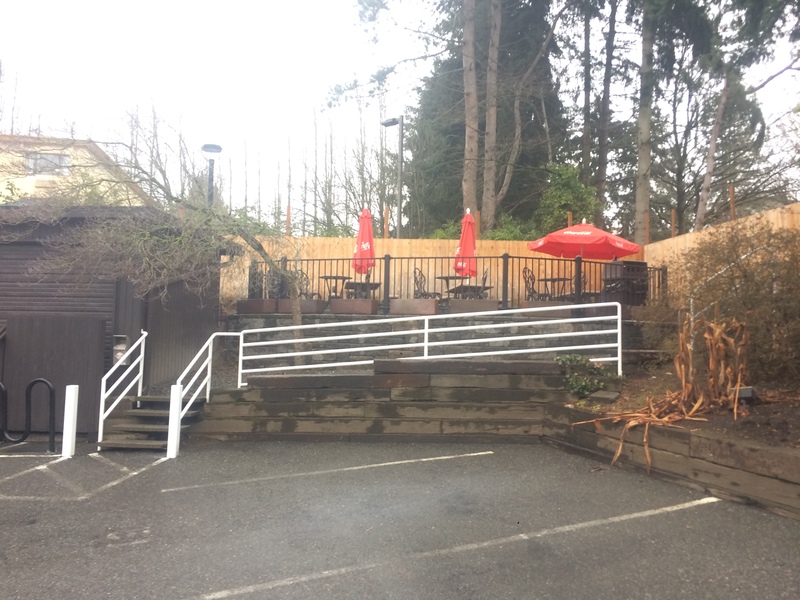 Had it not been cold and rainy, we could have eaten on the back patio. There’s even a bike rack back there! But given the weather, we were grateful to sit on the bench inside. Eating inside was pretty fun–my little guy was particularly enthralled by the order wheel: “I’ve only seen one of those on SpongeBob SquarePants before now!” And my big guy found the portable car jump starter by our bench quite fascinating. Then we biked back uphill through the hotel parking lot and up quite a lot more hill for two blocks to the start of the trail (on the sidewalk). 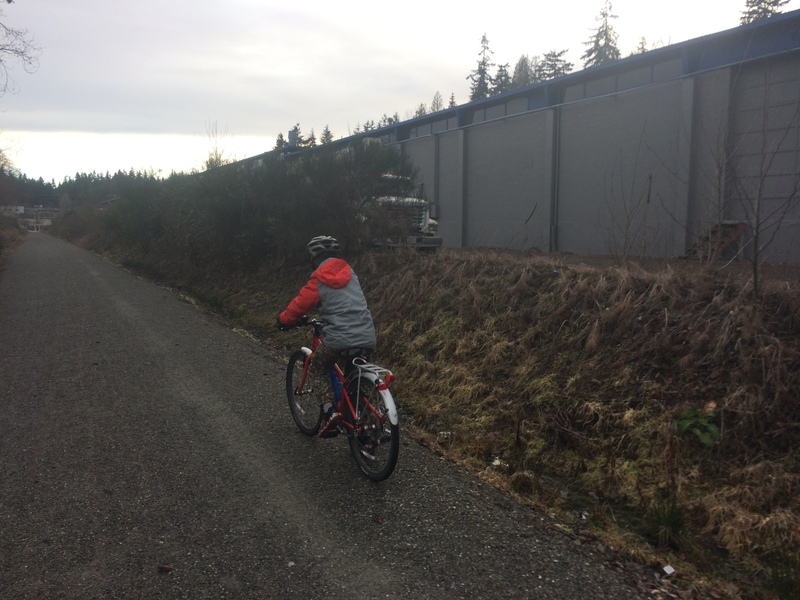 My nine-year old made up a little chant about how much he disliked the hill, but he was able to pedal up it without stopping. And then we were at the very beginning of the CKC. I read the Seattle Bike Blog article about it almost two years ago and had forgotten that it’s gravel! Fun! 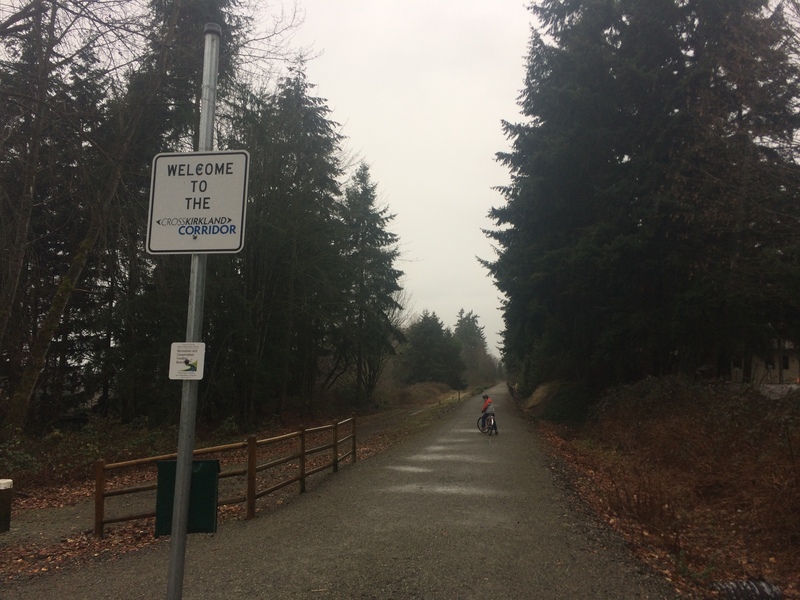 We rode 4.9 of the 5.5 miles of Cross Kirkland Corridor and it was awesome! 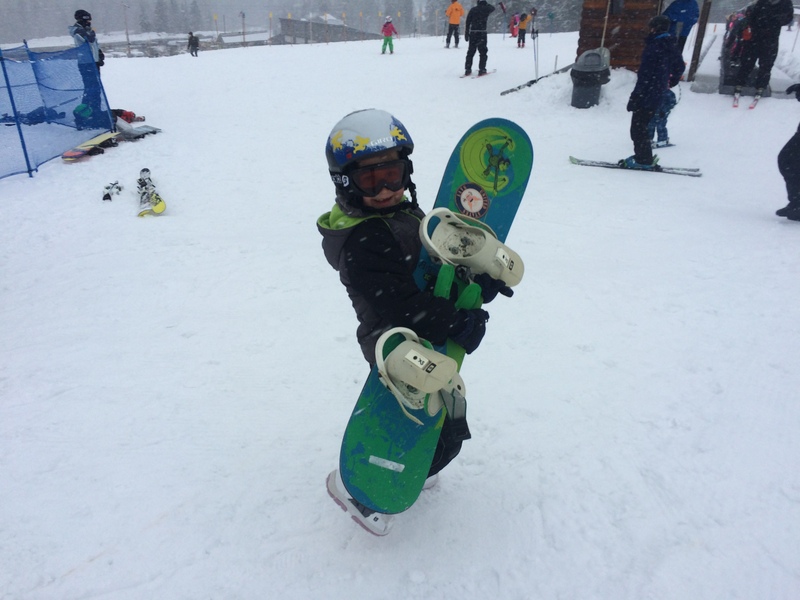 My nine-year old had the most fun of all, skidding–intentionally and alarmingly–every 50 feet the entire way. 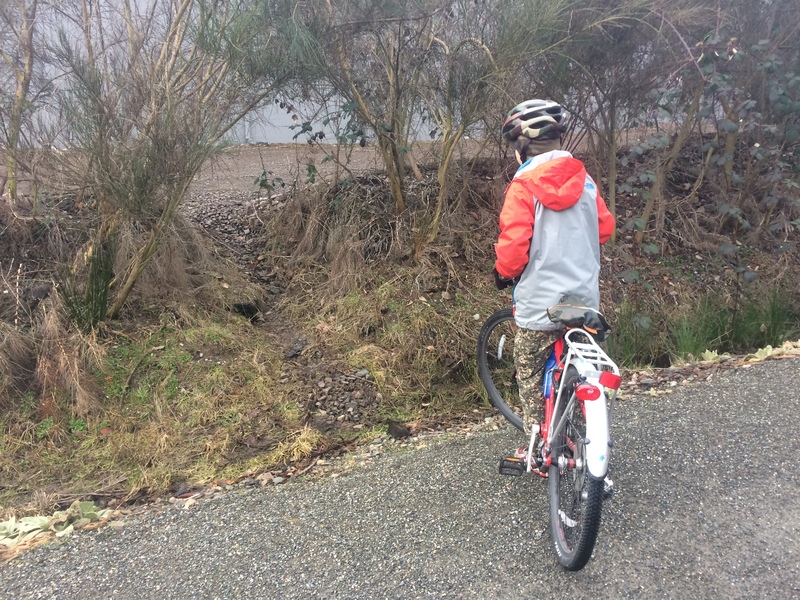 I was relieved I had just one kid skidding all over the place on his own bike this time, but we talked about coming back on three bikes–my preference is for a nice day in the summer, the kids’ is for an even rainier day because they’re really into wetlands habitats. 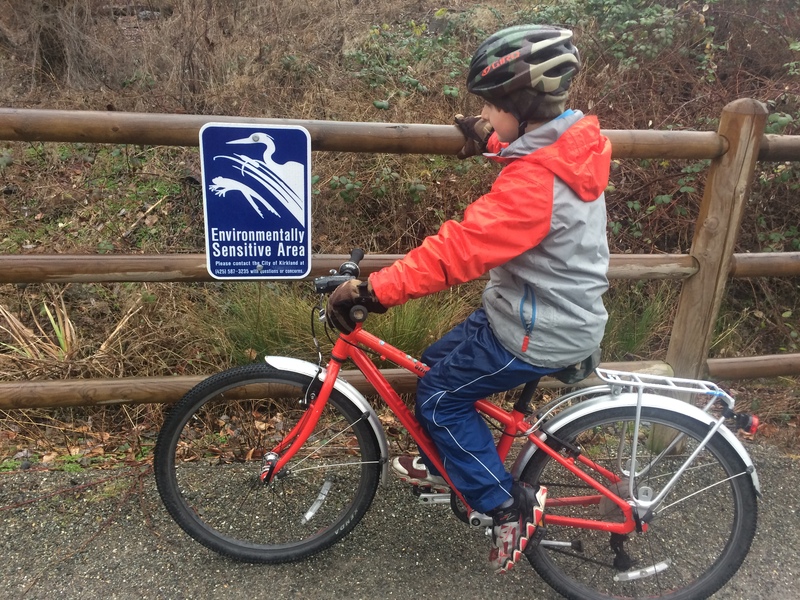 I forsee summer visits with trailside blackberry-picking stops, the kids plan to search for the “very large duck and badger” depicted in the Environmentally Sensitive Area signs. 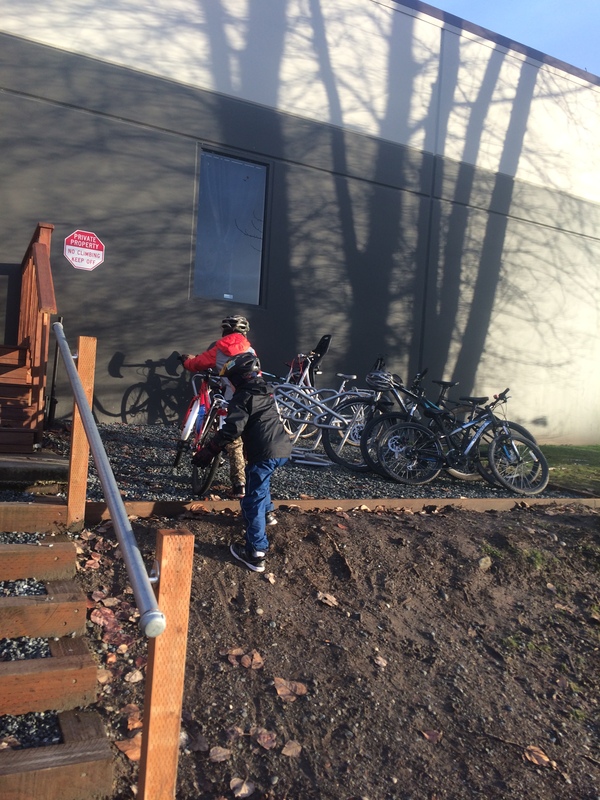 There’s a marvelous view of Lake Washington and the most of the stairways off the trail have runnels for easy wheeling of bikes. 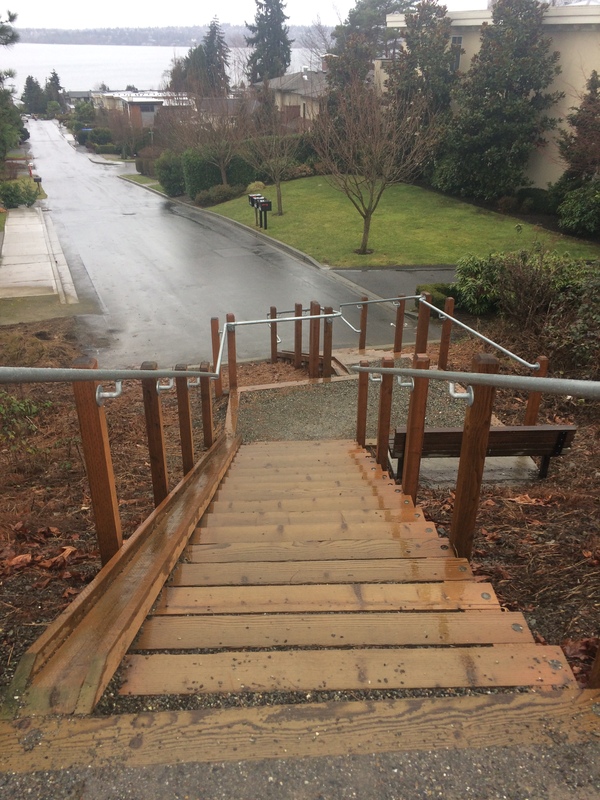 One stairway leads down to small Terrace Park (no potties), but even bigger and better and right at trail level is Google Park with zipline (though also no potties). Google maps had me exiting the CKC at NE 112th Street, one block before our destination, but rather than ride that one long block (on the sidewalk, of course, in this area) I decided to stick to the trail because even if it tunneled under our street, we’d have a shorter amount of sidewalk to ride back from the following intersection. 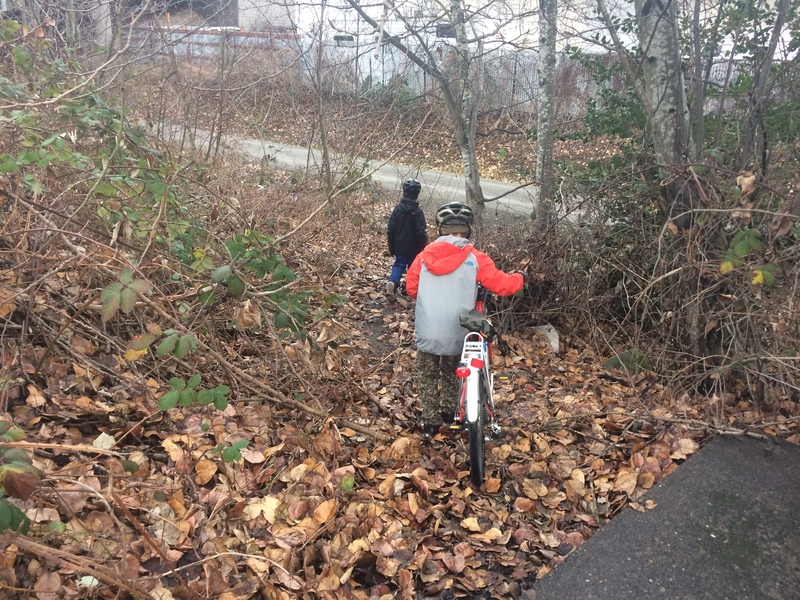 Turns out the trail did indeed cross under NE 116th Street, but that meant we got to ride a tiny bit more of the CKC. 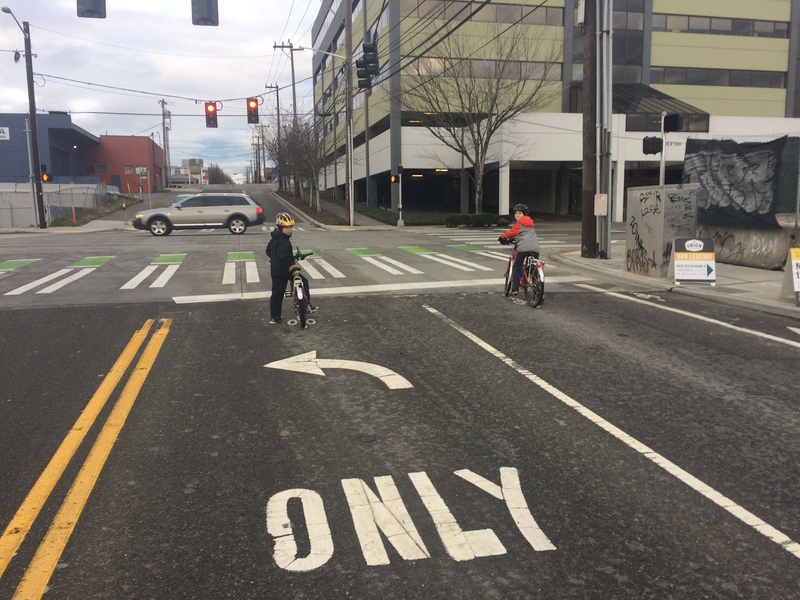 Unfortunately that also meant we had to cross a big street and the people turning right from 120th Avenue NE onto NE 116th Street were not keen on allowing us to cross in the crosswalk. 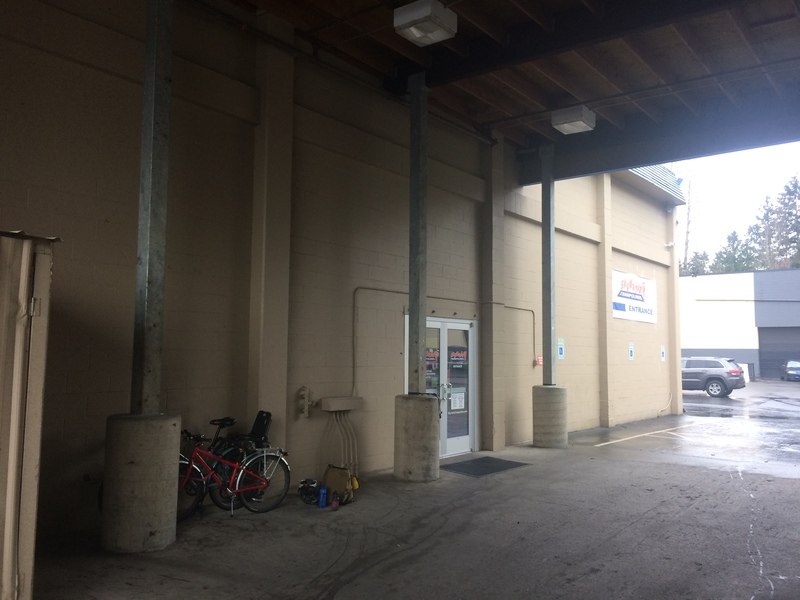 Skymania is in a big nondescript building with huge parking lot and no bike rack. But there was lots of space under the overhang by the front door so we locked up to a pipe under that. The kids LOVED the venue. 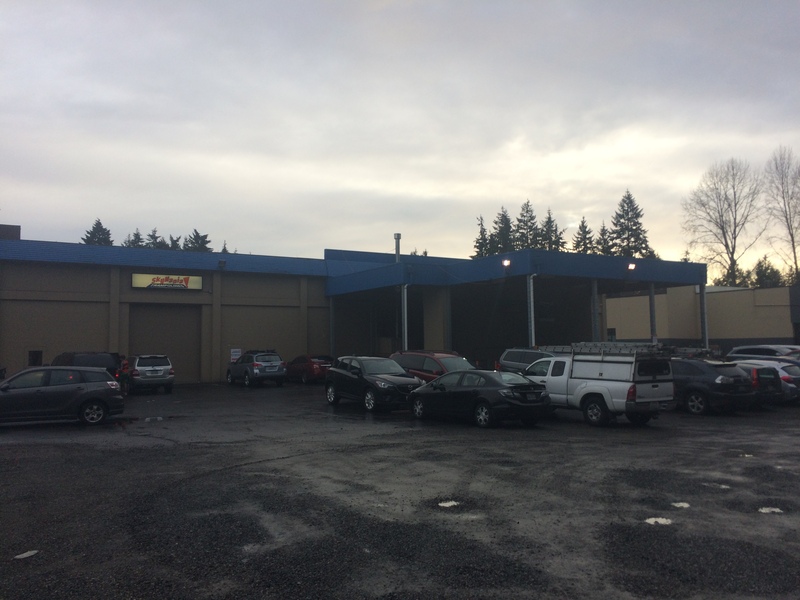 Two big trampoline areas, arcade games, and laser tag. The Waiting Lounge has chairs and tables, couches, and free wi-fi. But no outside food or drink allowed. Heading back we started along the sidewalk of 116th, prepared to check out the long block of 120th’s sidewalk we avoided on the way up. By the way, there’s a bike lane on 116th, but it has lots of cars crossing through it to get to the freeway entrances. 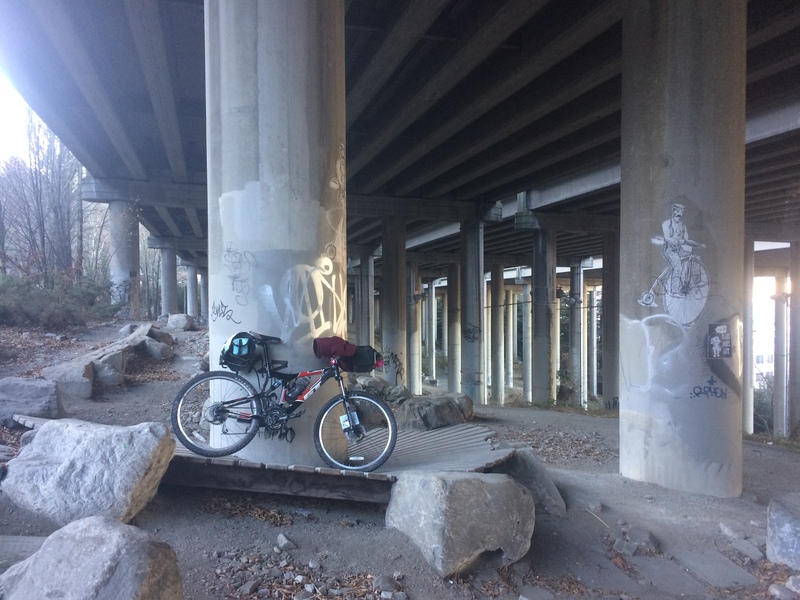 I stopped above the trail to see if there was any better option and it looked like it wouldn’t be too big a deal to ride down the driveway east of the car dealership and walk/carry our bikes a short way to the trail. Other than one pesky blackberry vine at the end, it was just fine. The dirt road alongside the long building to the west of the trail continues for the entire block so that would work even better for a trailer or other bike that couldn’t make the short rocky traverse. Chainline Brewing Company was great! The food truck was a no-show, but we went in anyway to buy a bag of chips and use the potty. The bike racks are up quite a slope, but plenty of people had wheeled their bikes up to them. There’s tons of bike decor inside–as well as some very cool light fixtures. 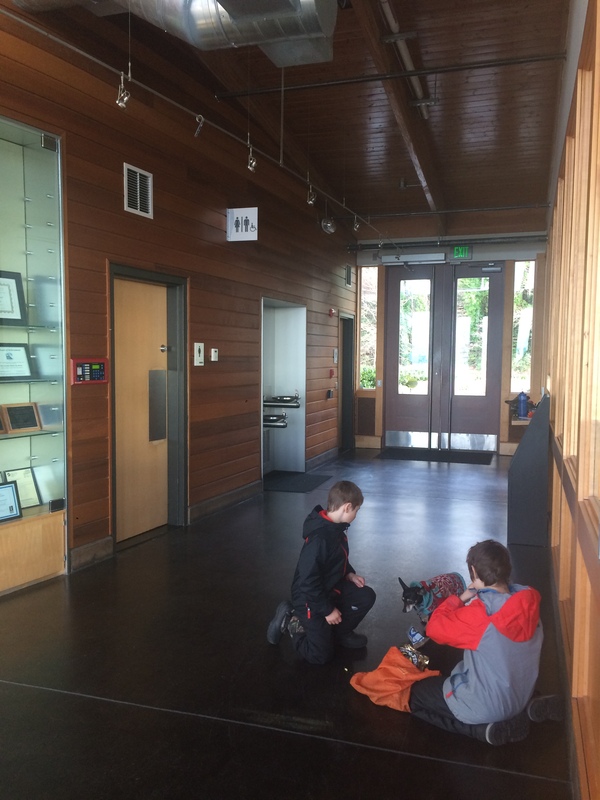 We’ll be back for sure–and we can bring Pixie because it’s kid- and dog-friendly! There were a ton of babies there, by the way. The bus ride and bike ride home went well. 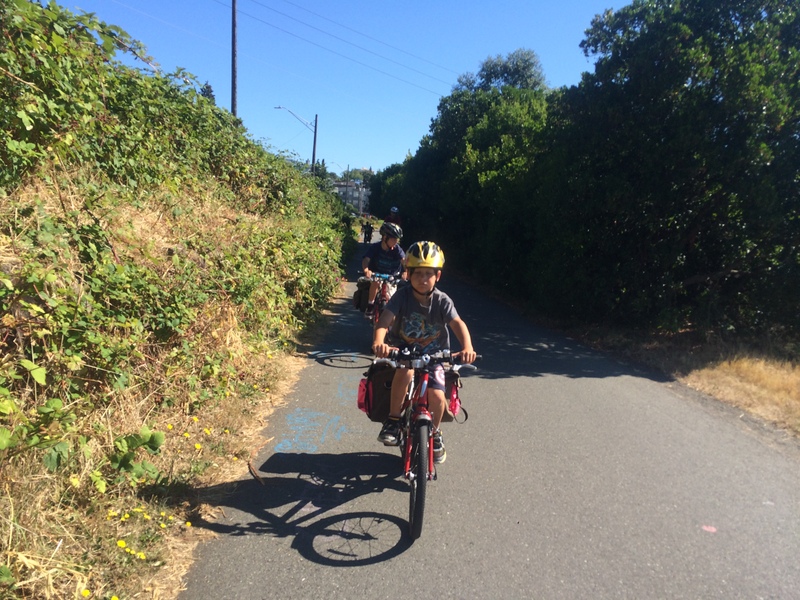 I’m so glad I had my seven-year old on my bike because mere moments after he asked if he could disembark to run the last few blocks home he fell asleep back there. 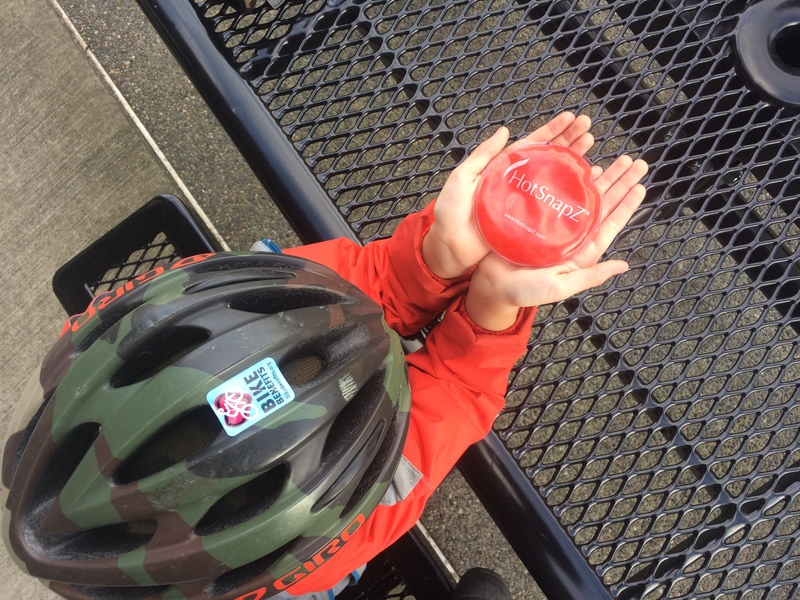 He tends to run at 100% capacity at all times–and sometimes burn out before the day is done–whereas my nine-year old and I pace ourselves. Obviously, we’re not nearly as fun. But we stay awake while plodding on home. I think a summer visit without two hours of jumping and laser tagging will leave us all with energy enough to ride the whole trail and visit all the playgrounds, though. 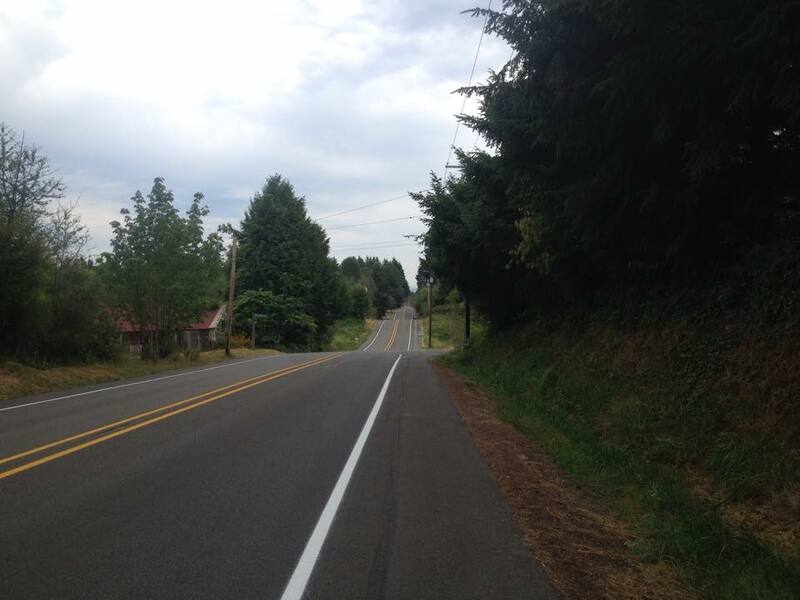 Here’s my Strava recording of the Kirkland portion of our day. Can’t wait to come back! I made a fairly last-minute decision to head down to Portland for the weekend with Pixie. 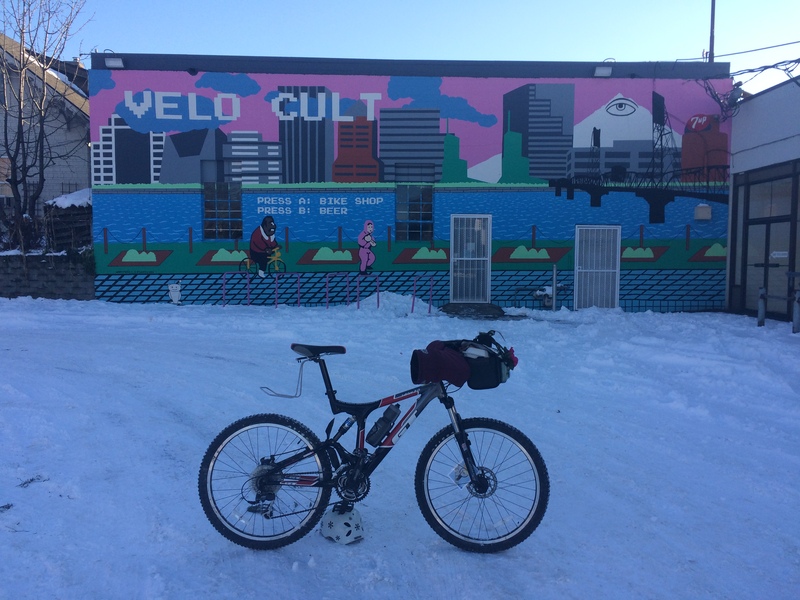 Then I made an even-more-last-minute decision to take my mountain bike instead of my Surly Straggler, thinking the knobby 26″ x 1.95″ tires would be better than the 700c x 38 mm slick but supple Barlow Pass Compass Tires on my Straggler because Portland is absolutely covered in snow. I found a pet-friendly Airbnb that was close-in so I wouldn’t have to do too much biking and could ditch the bike and walk if need be. The Carradice Bagman Quick Release Support went on easily, but the KLICKfix mount for my Swift Industries Paloma Handlebar Bag is sized for my road bike bars covered in bar tape so I shimmed it with lots and lots of old inner tube. [NOW I know inner tube should not be used as a shim.] I also swapped out my clipless pedals for flats and took a little Knog Blinder light from one of the kids’ bikes to put on my fork since I couldn’t fit anything else on the bars with the Portland Pogies handlebar mittens on. I brought my CygoLight in case I could figure out where to mount it (with plenty of spare old inner tube, of course). I also didn’t ride the gravel test track at REI. I guess technically I was test riding a bike (just not one of their bikes), but I was also in a hurry and only there on an errand. The front bag worked great! The pedals stayed on! 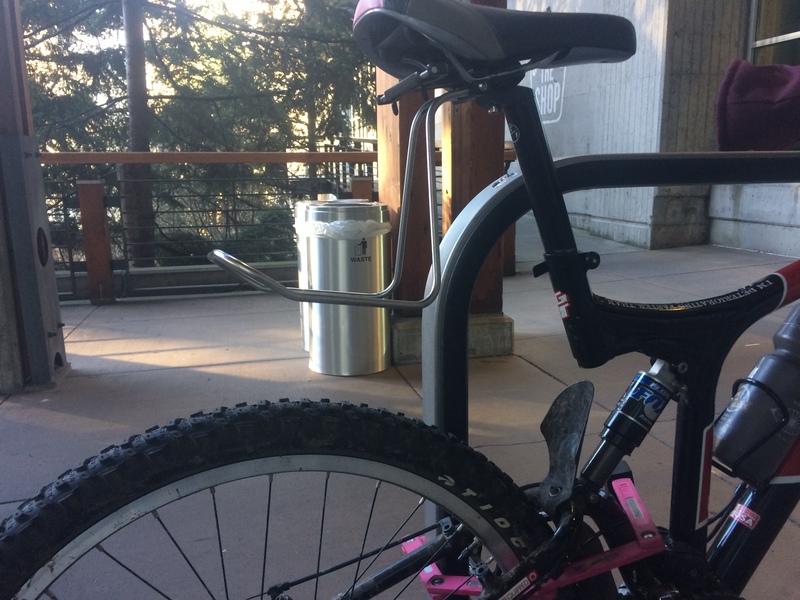 The rear bag, however… It looks like there’s a lot of clearance between the rack and tire, but that rear shock is really squishy. 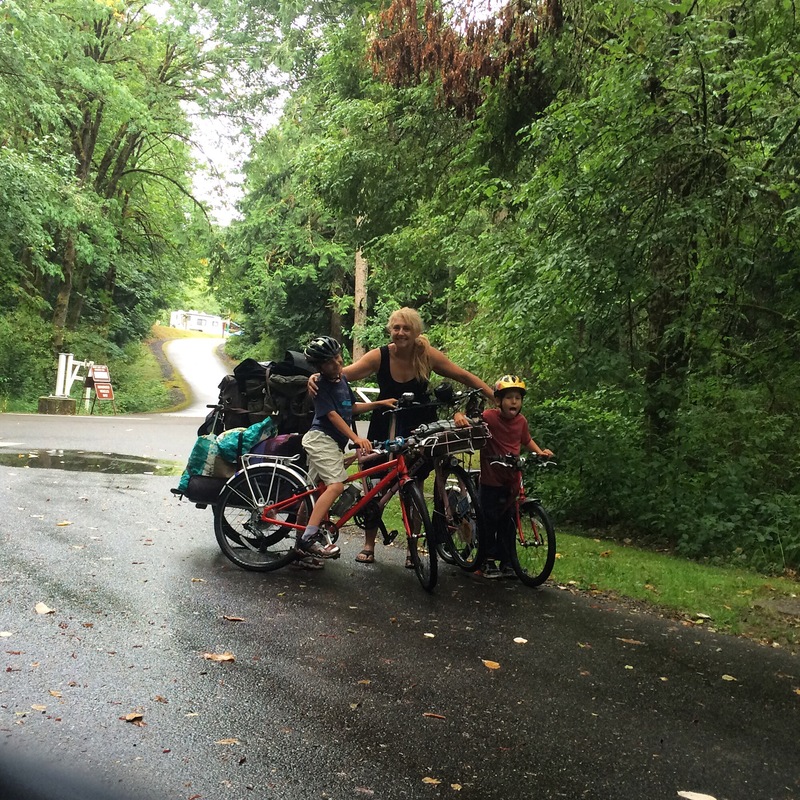 As I pedaled home and heard rubbing over each unnoticed bump (tiny bumps, even!) it occurred to me that I’ve heard the phrase “lock out one’s shock” so I Googled that when I got home, but it turns out I don’t have that kind of shock. 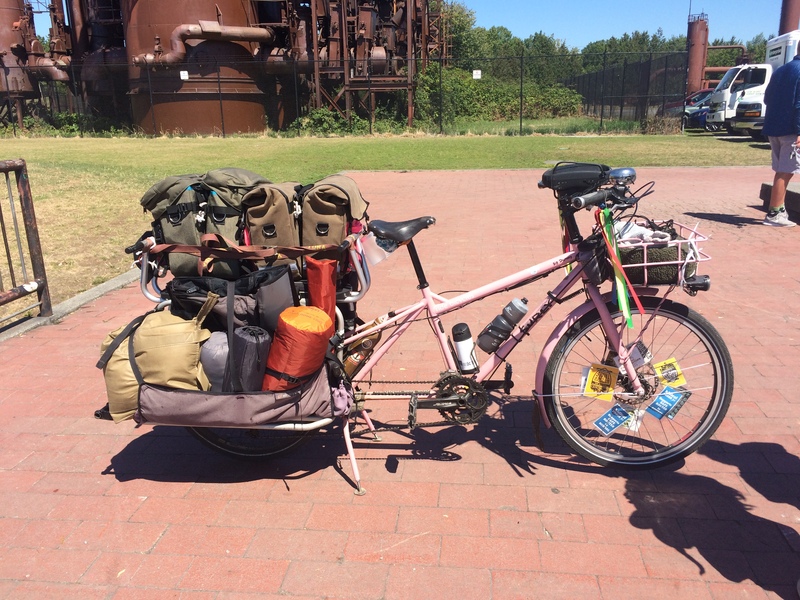 I considered taking my Straggler after all, but decided to pack even lighter than I was already forced to pack (handlebar bag + saddle bag is a lot smaller than two large panniers) and cinch the bag around the middle with a John’s Irish Strap. This helped on the tiny bumps a lot. And getting out of the saddle for medium and big bumps worked for those. There was still a bit of rubbing here and there on bumps I failed to notice ahead of time. 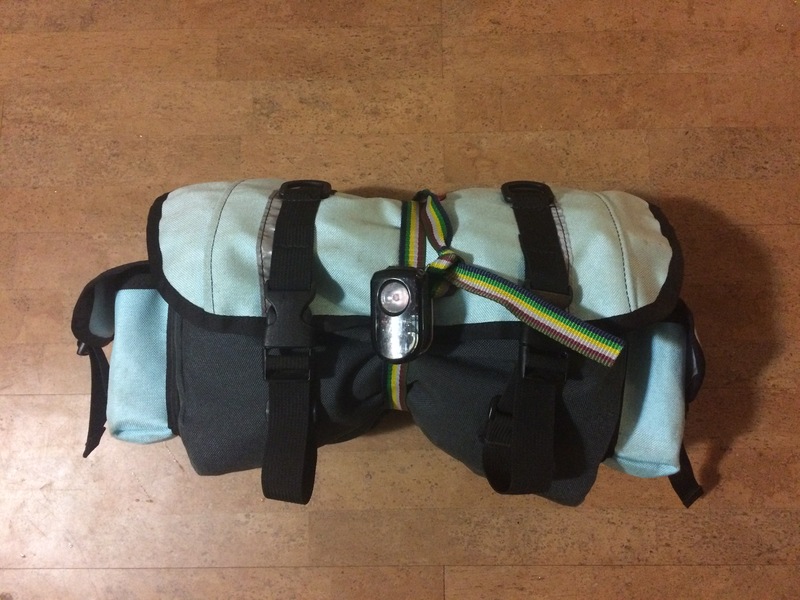 Once I loaded the front bag with lots of stuff–that’s my laptop in a cloth diapering dry bag (waterproof! I use this large size for swim suits) cargo netted on top of the bag–the bag started to droop. 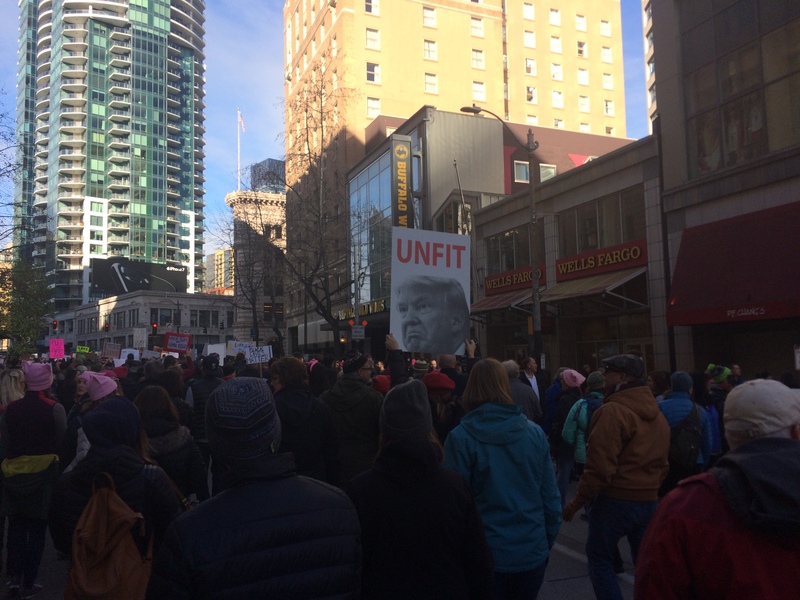 Fortunately I didn’t notice this until I got off the train in Portland so I wasn’t worried about it for the long train ride. First thing Saturday morning I hit the closest bike shop, Crank, to see if they had something better than inner tubes for me. Justin was SO NICE and instructed me that inner tubes should never be used as shims (shh, I’m still gonna use them for little things like bells) and found an old mount that uses the same sort of brackets and installed those. So now my bike was sorted. Without the Straggler’s front basket, Pixie was forced to travel in her Timbuk2 Muttmover backpack the whole trip. This was probably better considering the slippery snow. 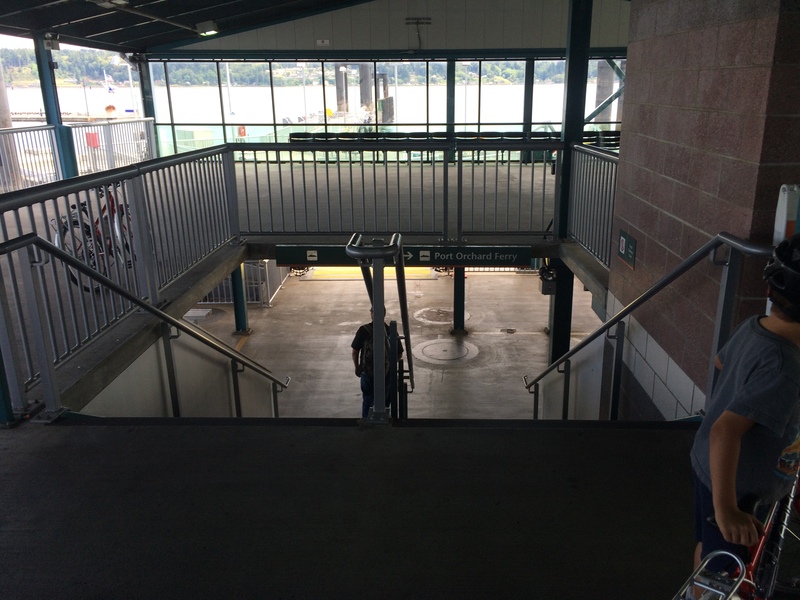 I recently took my first Amtrak Coast Starlight trip and compared it to Amtrak Cascades. I gleaned a bit more information about the Coast Starlight and about traveling with pets. First: you get two seats when you travel with a pet! I thought it was an accident on the way down, but on the way back the conductor told me that it’s for safety since there’s no legroom with the pet down there (not so if the pet is in one’s lap, of course, but them’s the rules so I got an empty seat next to me each way). Reading Amtrak’s All Aboard, Pets page, it looks like perhaps that’s only an Amtrak Cascades thing and maybe the extra seat on the way down shouldn’t have been. This is especially great when traveling with a pet, although earlier I stuck her in the backpack to walk to the cafe for a coffee. The lunch this day was a BLT with chocolate chip cookie and bottled water (and easy enough to skip the bottled water and utensils to cut down on trash/recycling). Obviously, I’m not a regular snowbiker/icebearder so this is not the place for all things biking in snow. 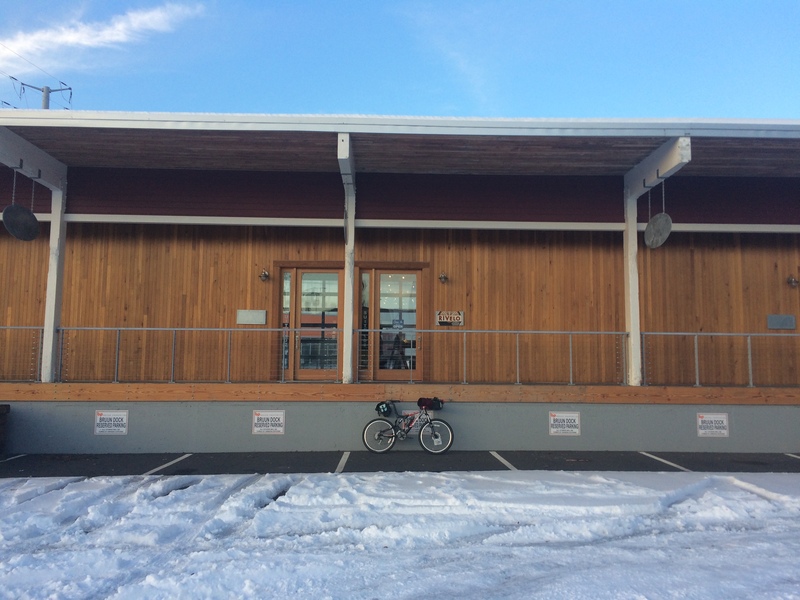 I have only one interesting observation: fighting to stay upright on a mountain bike in unpacked snow is not unlike stubbornly refusing to put a foot down while inching along behind two circuitous toddlers on balance bikes on a cargo bike in gravel. So the snowy snow felt familiar, but I still hate ice. I slipped and fell to the ground once on Saturday. After that I successfully hopped clear of my tipping bike three times. Pixie was unscathed and seemed not to even notice my fall and jumps. I got a bit better at recognizing surfaces too icy to ride over, but I still fell a few times on Sunday, too. The first I went down hard on my elbow and expect to see a nice bruise soon. 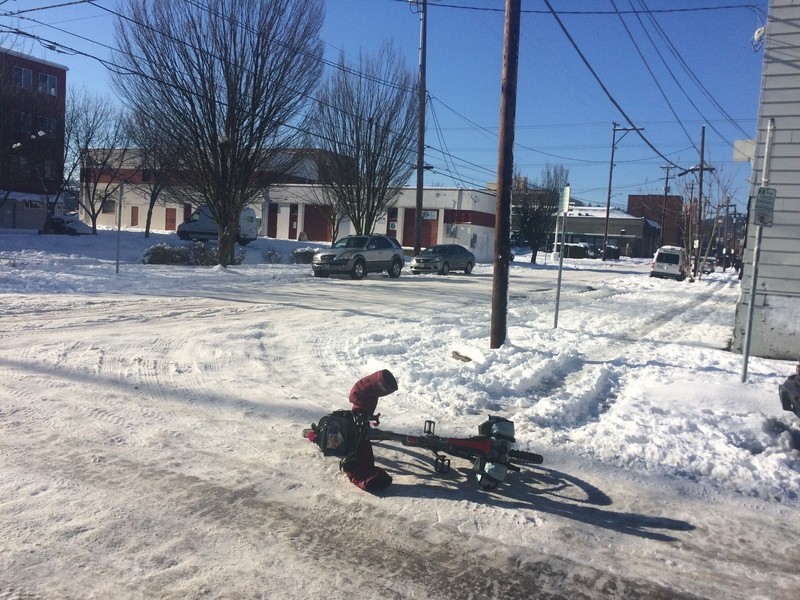 That was as I realized I was on a hill (steeper than the very slight icy downhill that felled me so many times the day before) that had turned from snow on top of ice to just ice and as I VERY VERY SLOWLY applied my brakes to dismount and walk, down I went. But I got pretty good at choosing spots to slow to a stop and get off to walk. Walking isn’t easy on the ice, either, but using the mountain bike as a outrigger to help balance made it a lot easier. I never fell while walking the bike, but I got off the ice as quickly as I could (and by quickly I mean very slowly, but via the most direct route). Sunday was slushier than Saturday, but there was also more ice. Most my falls were on sheets of glassy ice, but running up against the icy edges of ruts was wobble inducing, too. All weekend people kept talking about Seattle’s snow plows having come down to Portland to help plow the roads. I didn’t much evidence of plowed roads, though. I think the streets too busy for me to ride on were plowed, but that didn’t mean they were clear of snow as this non-snow-experienced visitor would have expected, rather the snow was packed down much more in the roads than it was on the sidewalks. If I lived somewhere snowy, I’d love to have a set of studded snow tires. Of course I can’t say that I’d bike as often in the winter if it was snowy. It’s still faster than walking and more reliable than transit (the bus app in Portland temporary replaced “minutes away” with “distance away” since it’s impossible to predict in these conditions) so I have a feeling I’d stick with biking. I certainly wouldn’t want to drive in these conditions–eek! I really didn’t ride much either day: 5.8 miles on Saturday and 7.9 miles on Sunday (divided into three trips: 4.4 miles + 1.5 miles + 2 miles). Had the streets been clear, I would have done more stuff, but for a last-minute trip and tiring snow, this was just perfect. One cold-weather thing I think I finally got figured out is keeping my phone running. I keep my iPhone 5s in a LifeProof case at all times (waterproof and shockproof for those of us who have dropped phones in toilets and on hard cement) and attach it to my handlebars with a LifeProof Bike + Bar Mount so I can listen to the Google Maps app tell me where to go. My previous phone, an iPhone 4s worked better in the cold and would shut off when the battery was at 20% on very cold days. This phone seems to do the same at 50% battery. It seems to work slightly better if it’s doing something–like giving me directions or playing music. But keeping it plugged into an external battery (I have a RAVPower Deluxe that has a little built-in flashlight I’ve never used other than accidentally turning it on and blinding myself, but it might come in useful someday) kept me running all weekend. As previously mentioned, I started Saturday with a visit to Crank. This is a great bike shop! Lots of cool bikes, including Public Bikes in adult and kid sizes. And a dad came in with an Islabikes that needed its rear wheel trued from excessive jumping and skidding (that sounds familiar!). 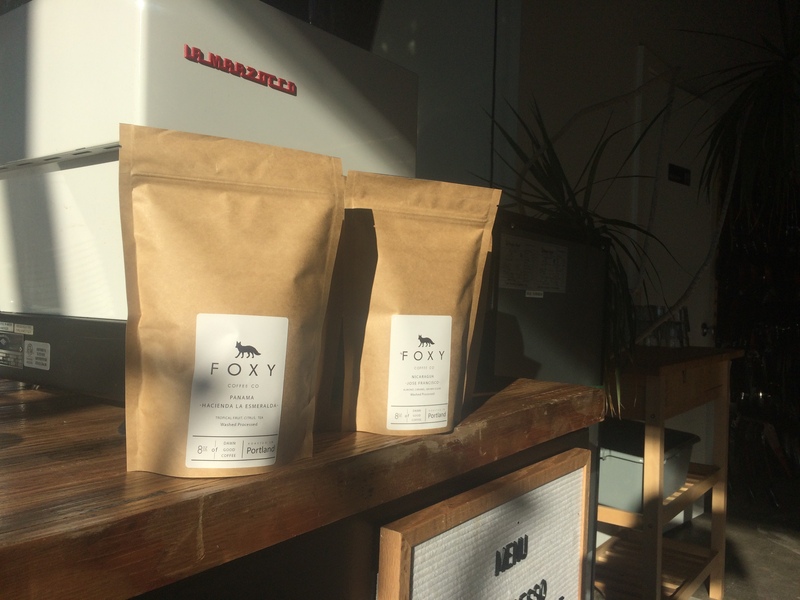 Also exciting was my happening to be in on the day of the soft opening of pop-up in-store coffee by Foxy Coffee Company. Great coffee and the best hot chocolate. 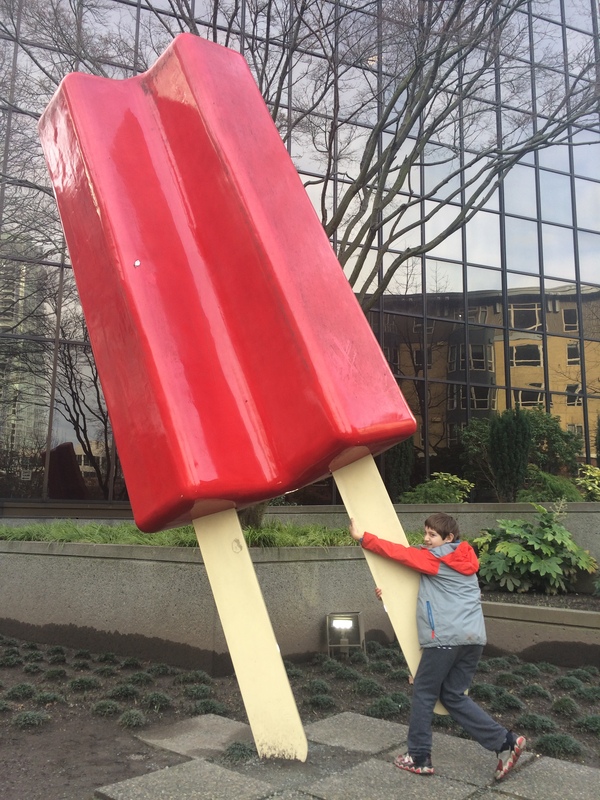 Look for them popping up all around Portland. Next up I went to Clever Cycles to meet up with friends. 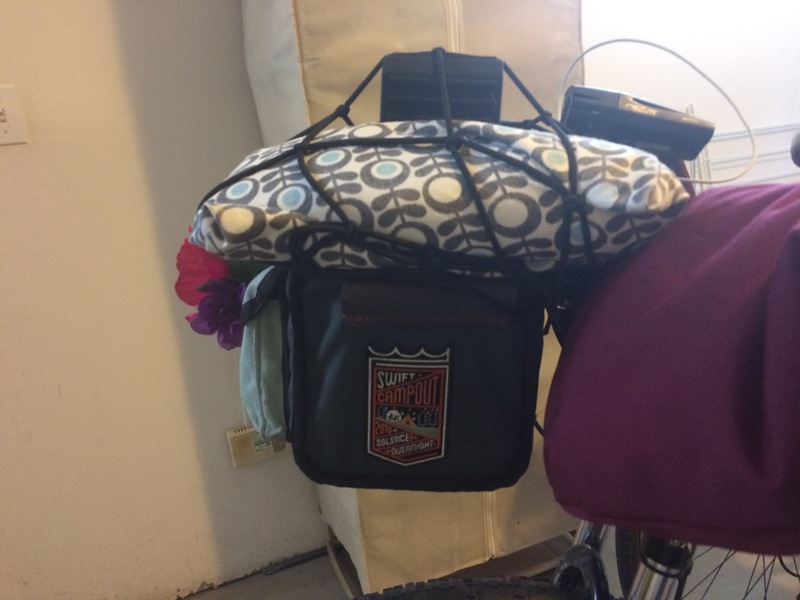 While there I got a Problem Solvers Handlebar Accessory Mount like I’ve seen on a friend’s bars to get her light up above her Paloma bag. It was nice to have it on the mountain bike for this trip, but it’s really for using on my road bike once home. 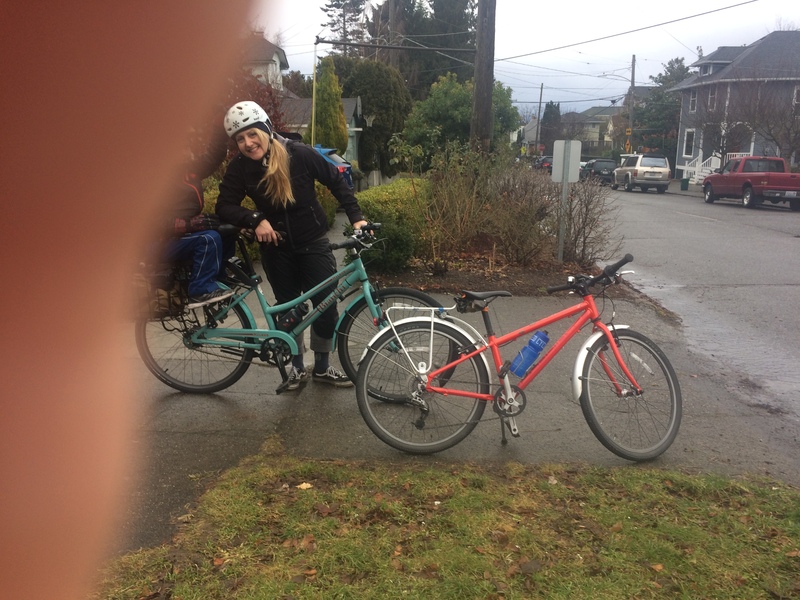 Kath met me with her daughter on her Bike Friday Haul-a-Day midtail and my best-friend-from-when-I-was-little-who-moved-to-Portland-a-year-ago-yay! Miwa came by bus from her southwest Portland neighborhood. We walked our bikes a couple blocks to Lardo because it has a big heated tent where Pixie was welcome. And it’s delicious! We left our bikes there and walked a few blocks to Upper Left Roasters (because they’re at the upper left corner of Ladd’s Addition, says Kath). I had the special, a maple turmeric latte, to combat the tiredness brought on by being out in the cold. The cold is really sapping my energy this winter! I don’t remember it being so bad in the past, but I’m sure I’ve just blocked it out for survival’s sake. Miwa hopped back on the bus and Kath bravely led the way to Rivelo. No falls, but we had to walk in some deep sections and over rails. I love Rivelo. I picked up some more John’s Irish Straps because they’re great for everything, including giving away to friends, so I don’t have enough to hold all my stuff on. They also have two sets of Portland Pogies, the handlebar mittens I like so much. And several signed copies of my book, Urban Cycling: How to Get to Work, Save Money, and Use Your Bike for City Living. Did I mention the cold makes me tired? I got home at 6 and was done for the day. 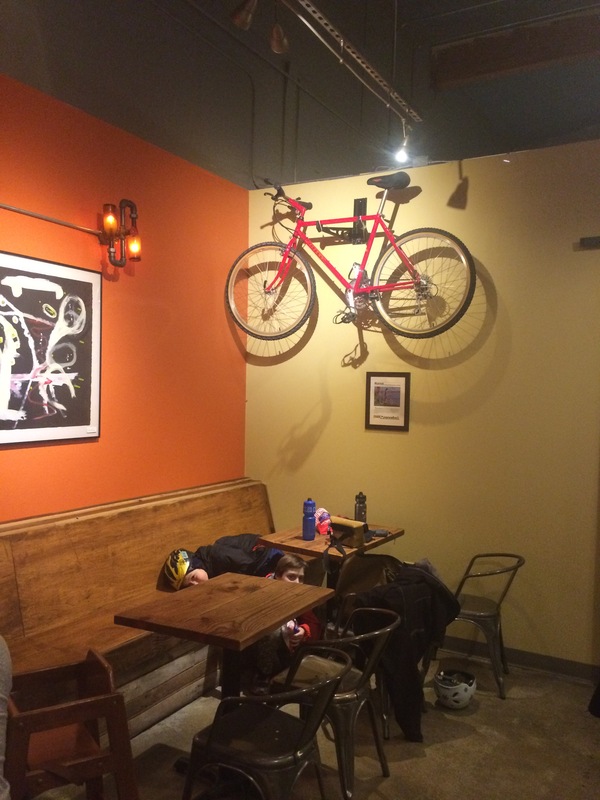 I thought about calling in a to-go order at bike-friendly (and with dog-friendly outdoor heated seating, too!) Pambiche Cocina & Repostería Cubana around the corner, but I couldn’t even muster the energy for that. Packing light meant I didn’t have snacks for 20, but I still had snacks for me so I survived the evening without outside food. 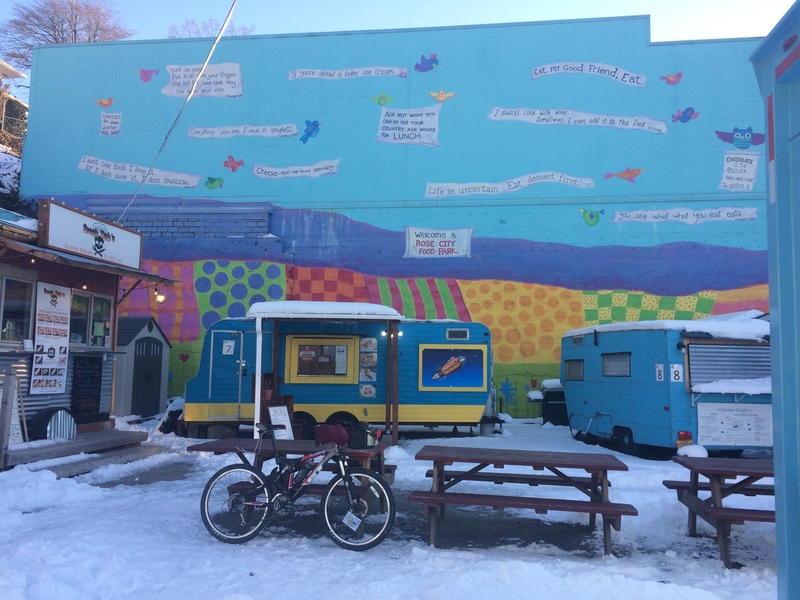 It was too cold to stay and eat more than a couple bites on site, but we’ll be back after the thaw. 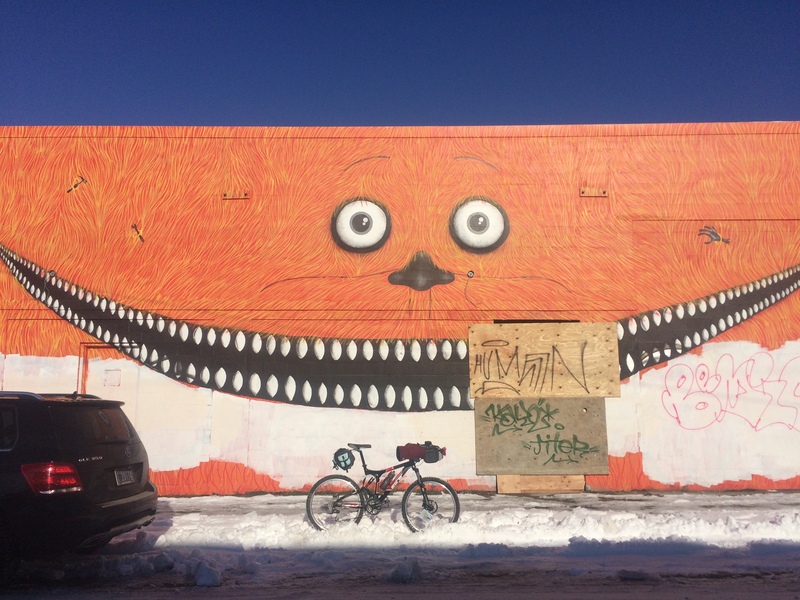 Since I was close to Velo Cult bike shop/bar/coffee shop I swung by to take a picture of my bike by the mural, even though they weren’t open yet. 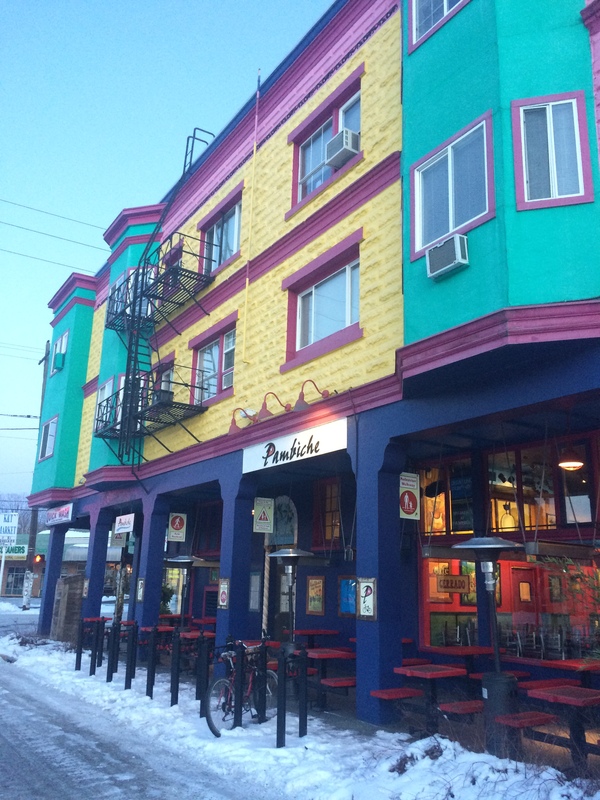 This would have been the perfect place to bring Pixie Saturday night (with food brought in from a nearby take-out place) had the streets been clear. 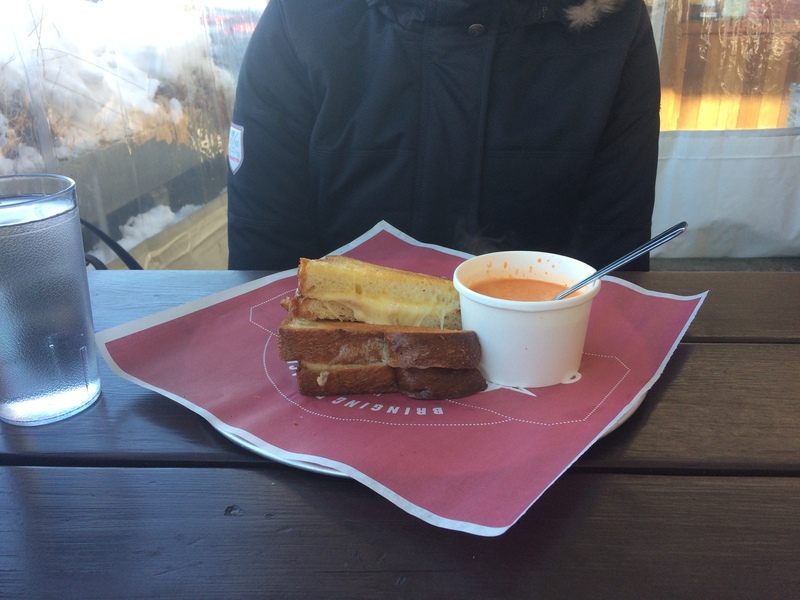 Then after packing up and checking out, back to Lardo with Kath–because I didn’t know of a similarly warm Pixie-friendly place, but mostly because I couldn’t stop thinking about the grilled cheese sandwich and tomato soup Miwa had the day before. 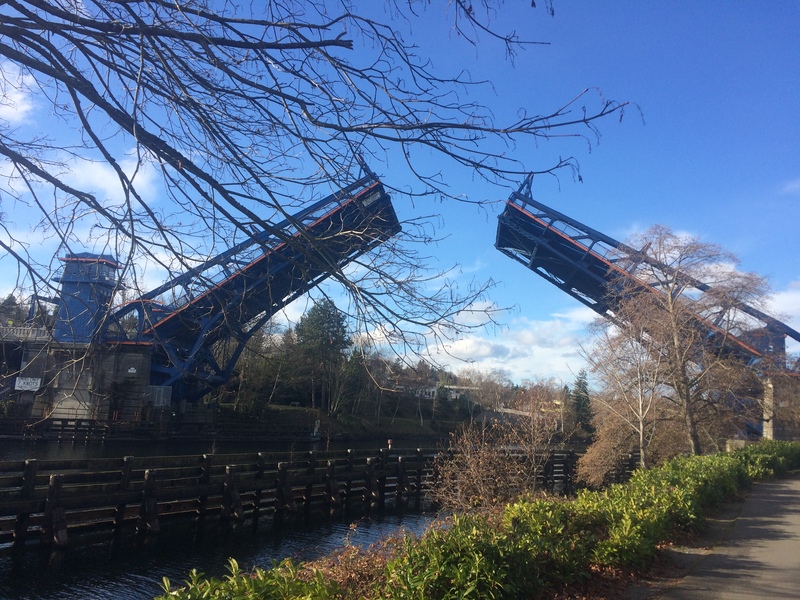 In nice weather I would take one of my favorite two bridges and a trail to get to the train station: either Eastblank Esplanade to Steel Bridge or Tilikum Crossing to Waterfront Park Trail, but I doubted the trails would be passable so I opted for the Hawthorne Bridge and Naito Parkway. 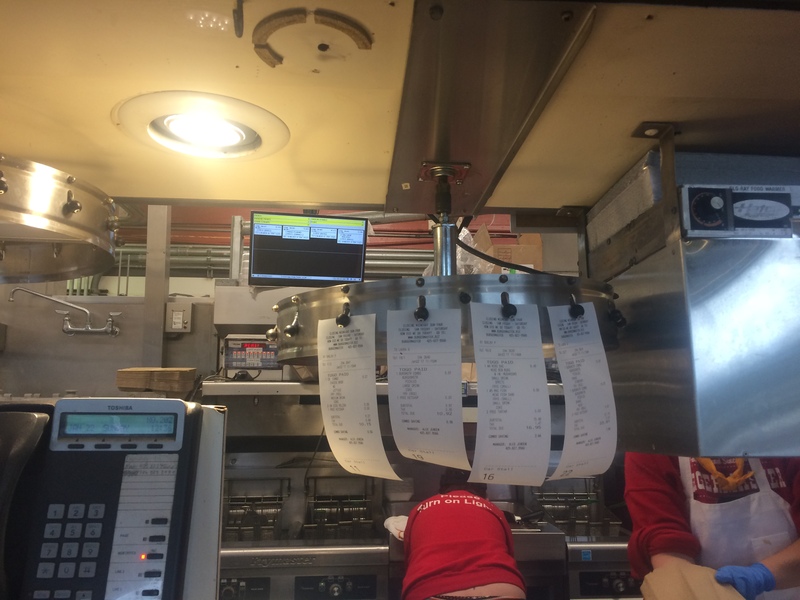 It was OK–mostly slush and some ice. 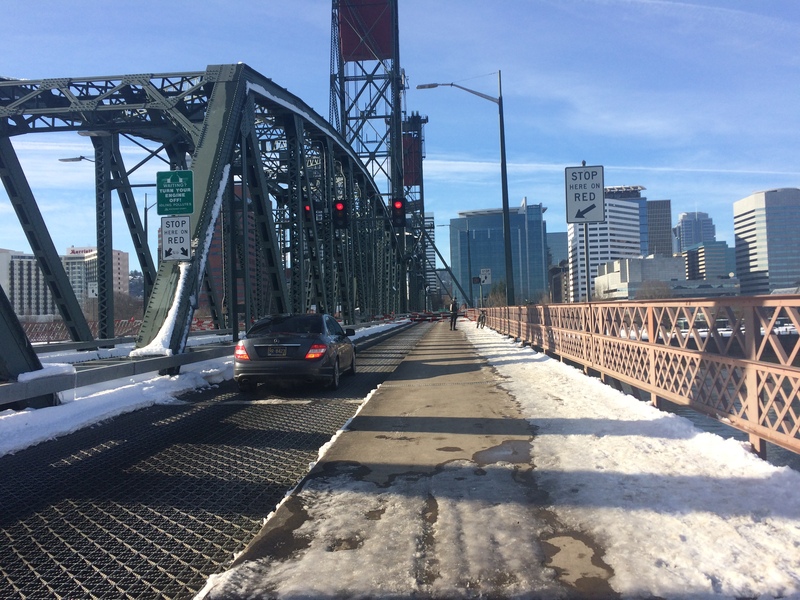 The bikeway/walkway over the bridge the salted and clear (well, half of it). Things were really slushy downtown…from more cars and buses? There were even some proper puddles to ride through. It was a wonderful visit and this small dose of snow was fun, but I’m happy to be home in warmer Seattle. 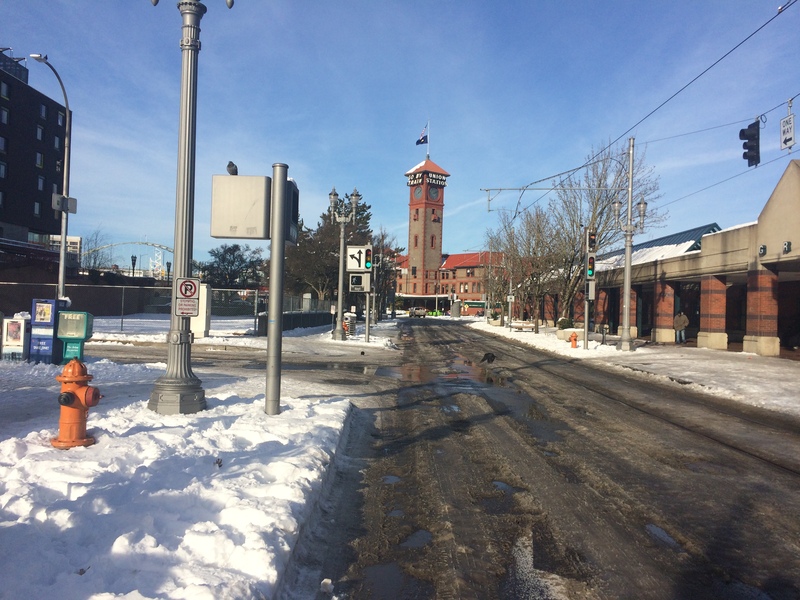 Next up for Portland is thawing and flooding. Good luck! 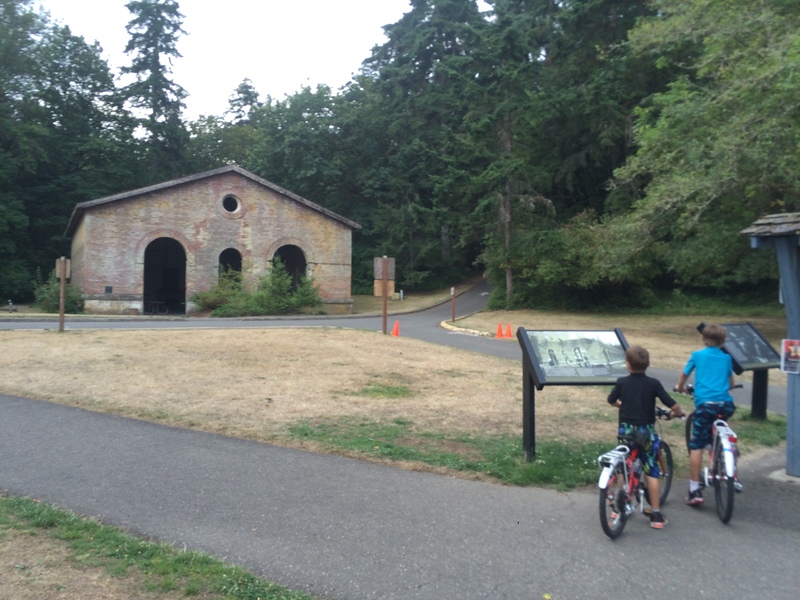 I found a bike camping spot easier (sort of) to get to than our old favorite Fay Bainbridge Park & Campground–welcome to Manchester State Park. We took two trips this past summer so we’re not total pros, but we learned quite a bit. This two-ferry, never-on-a-Sunday route isn’t the only way to get to Machester State Park. 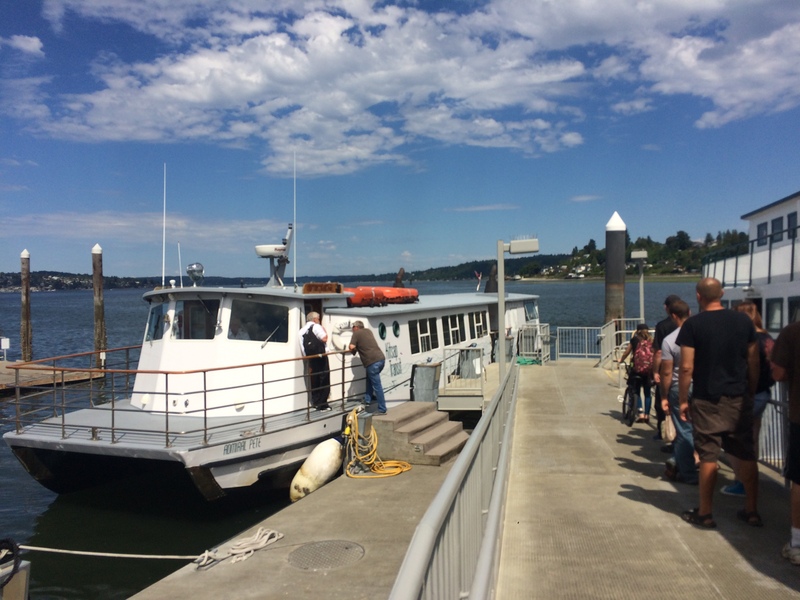 One can also take the 40-minute Fauntleroy-Southworth Ferry. I made this longer-but-simpler trip two summers ago to camp with a dozen other adults. 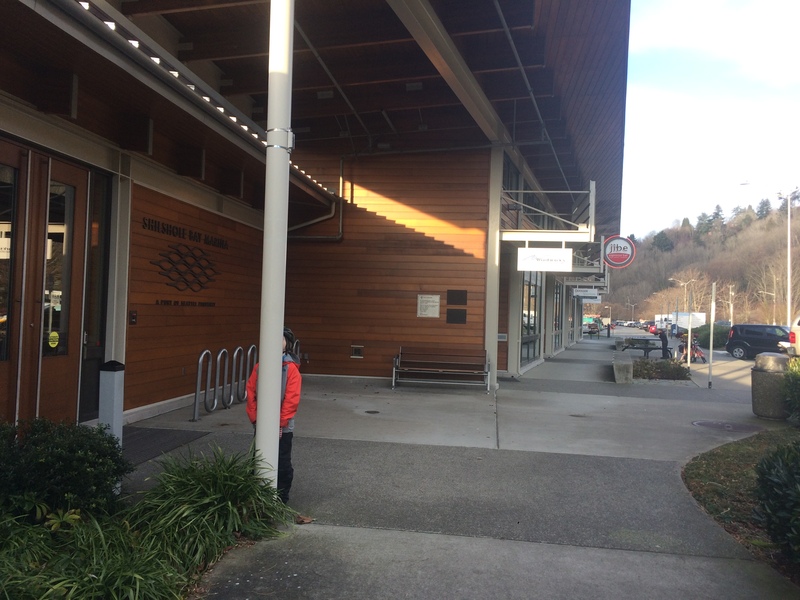 It’s a 17-mile ride to get to the ferry (versus 6 to the Seattle Ferry Terminal). 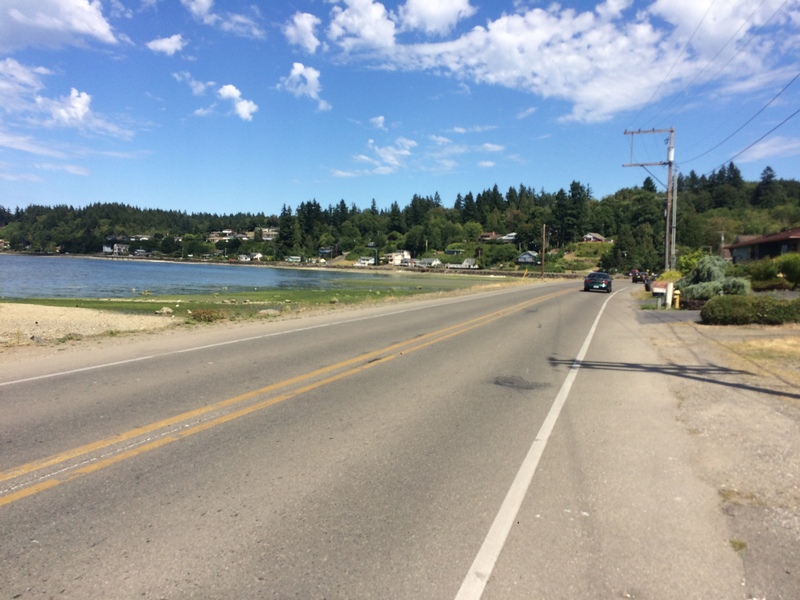 Once off the Southworth Ferry, it’s 7.6 miles of rolling hills. It’s hard for me to imagine how those hills would feel with passengers and/or more gear, but I don’t think I would have enjoyed them…and I’m pretty sure the kids would have hated them. 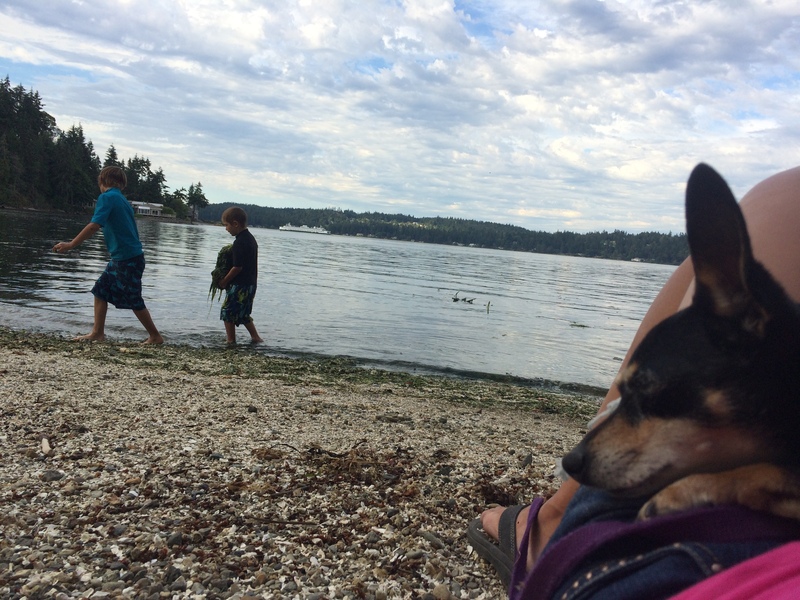 Side note: we’ve biked/water taxied to Lincoln Park (by the Fauntleroy Ferry Terminal) as a family once, but deemed it too far away so we haven’t been back in six years. 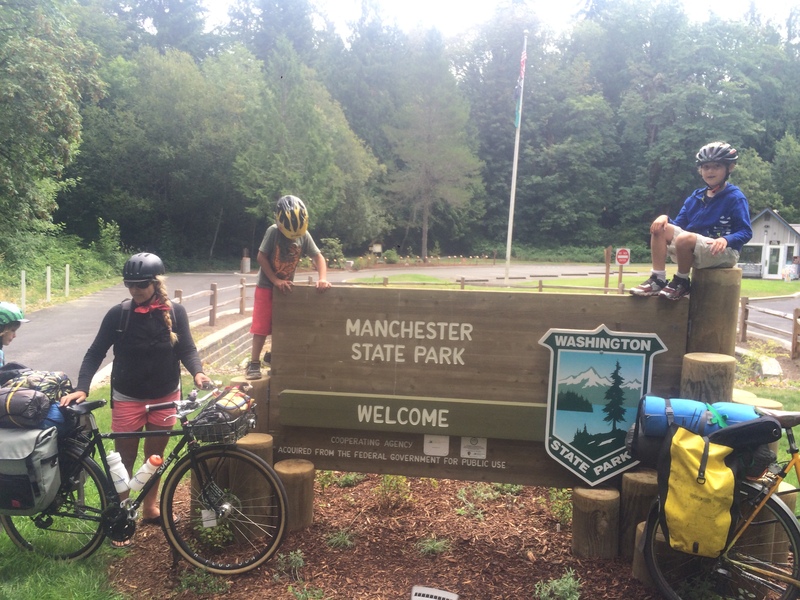 For our first Manchester State Park family bike camping trip, a Thursday to Friday, I rode the Big Dummy and the kids rode their own bikes–each with two little panniers containing sleeping bag, sleeping pad, and small camp pillow. 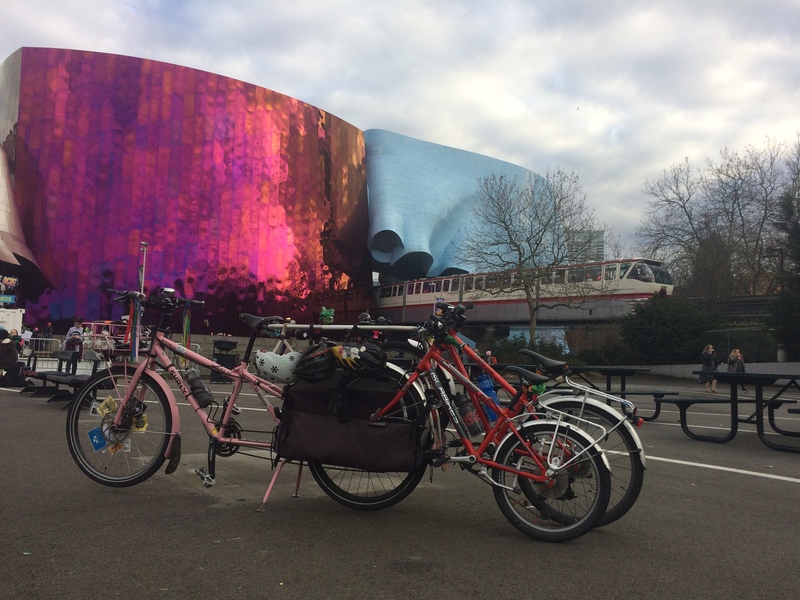 They were not a fan of riding with panniers so they only carried them a mile to Gas Works Park where we started our day with #coffeeoutsideforher. 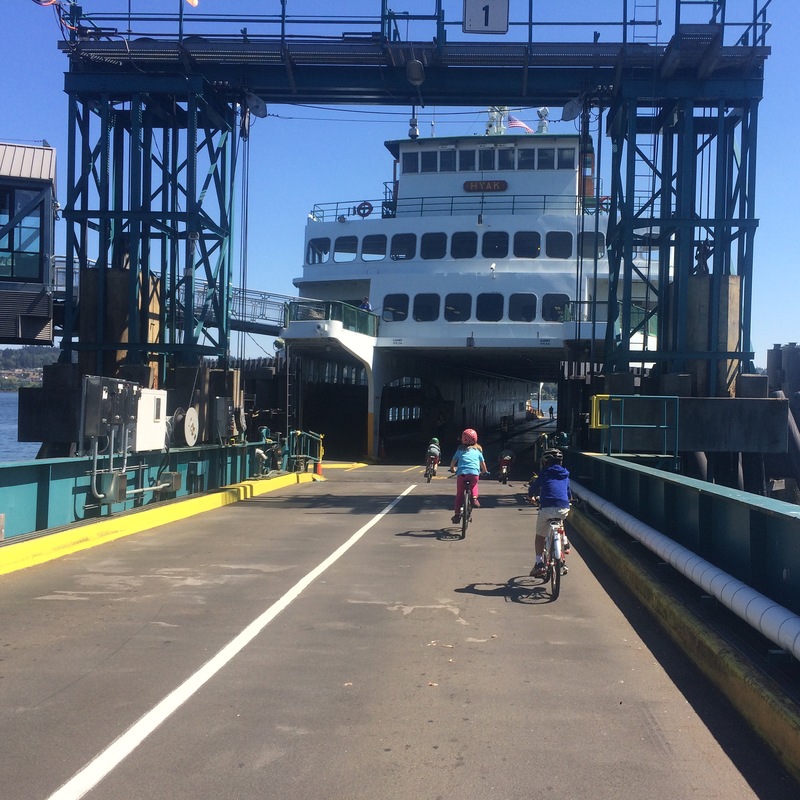 The Bremerton route allows bikes to ride aboard, just like Bainbridge. Super fun! 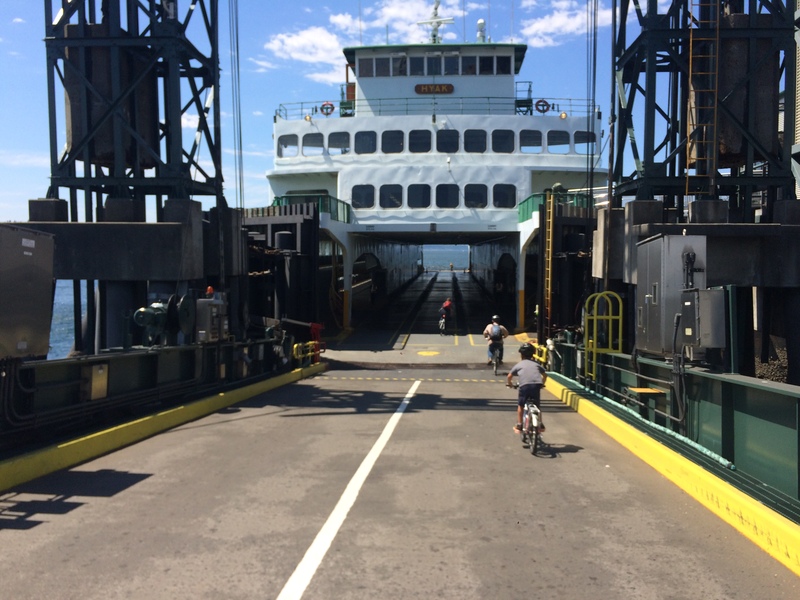 This is the same ferry we took for family bike camping at Illahee State Park, by the way. But rather than climb climb climb four miles to the campground, we biked the equivalent of one flat city block to the foot ferry. This was where I ran into trouble because the foot ferry is accessed by 17 steps or a small elevator. The foot ferry is small, but it was possible to maneuver the Big Dummy aboard. This was our first time in Port Orchard and it looks adorable, but we didn’t linger to explore before heading for the park. Bay Street and Beach Drive are both flat and have a great coastal views. Two-lane roads aren’t my favorite, but we didn’t see many cars. Most of the way had shoulders and the few cars that passed us gave us a lot of leeway. There was a bit of climbing once we left the coast, but at least this was in the shade. Then it flattened out just before the hill into the park and THERE ARE CAMELS AND HORSES next door. The kids were too hot and tired to appreciate the camels, but I’ll play them up before we head back. There’s one hill before the camels and one hill after so I hope to use the camels as incentive to get up the first hill this summer. Unlike Fay Bainbridge with its convenient kiosk, we had to pay at the entrance which meant we couldn’t skip the line of cars. We chose one of the three hiker/biker spots–$9 each and no fire pits. They’re not right by the restroom, but it’s right by a nice trail and blackberries. None of the campsites are right on the beach like at Fay Bainbridge, but that means it’s not completely exposed on hot days and it doesn’t feel like a big parking lot. 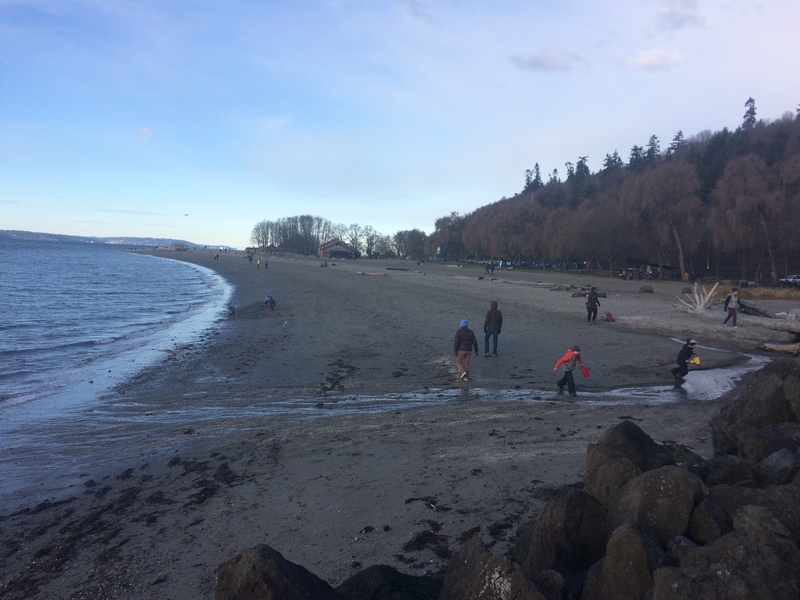 The beach was a quick bike ride from our site (and is also walkable for those so inclined). The most easily accessed beach is STINKY, but you get used to it after a while. 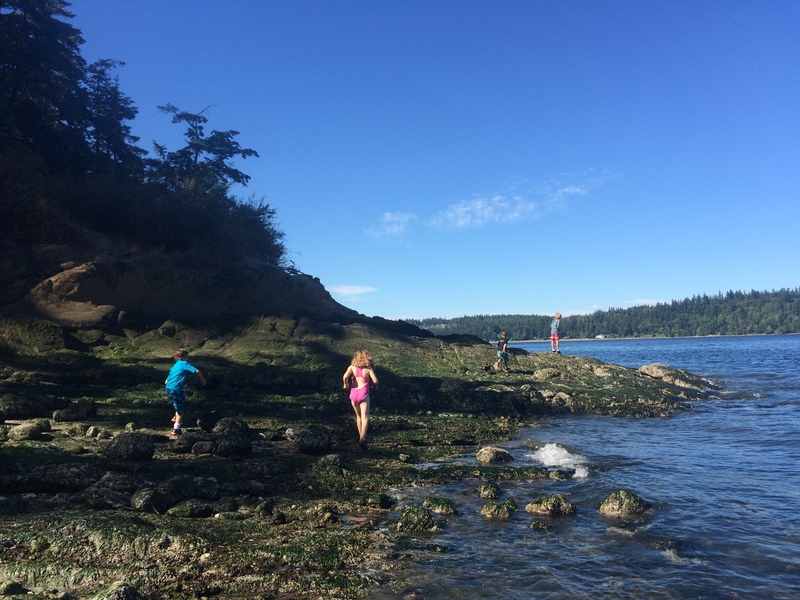 The kids enjoyed piling up the stinky seaweed, but we didn’t go into the water because there were jellyfish. I have a feeling it’s not always jellyfishy here. Note the Bremerton ferry cruising by in my photo below–fun view! This is a great campground if you have a camper into old military stuff. There are several structures, like the torpedo storehouse pictured below, all with interpretive signs. We were surprised by unexpected rain overnight which was good in that it got us on the road early. I sent the kids to stay dry and warm in the restroom while I quickly packed us up. 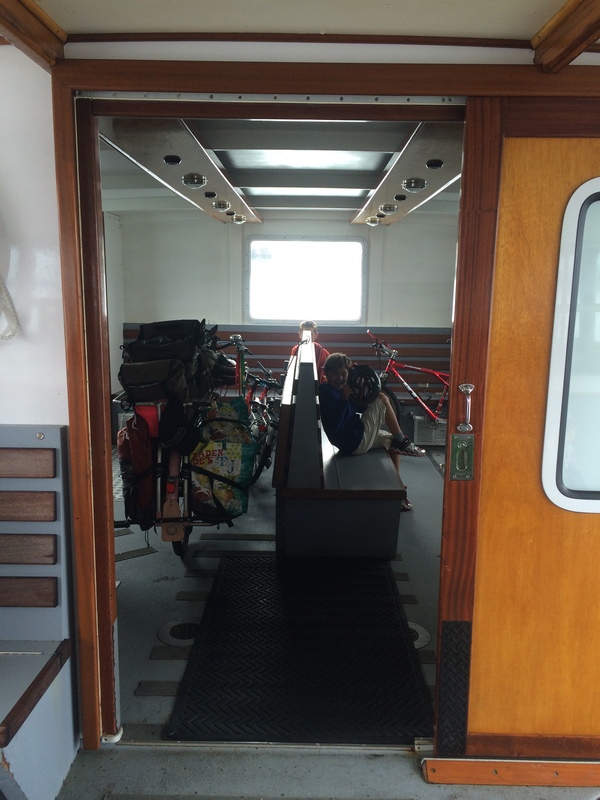 The foot ferry back was easier thanks to knowing ahead of time what I’d be in for in terms of wedging the cargo bike onto the boat, plus this time I was able to tilt my bike upright on my own for the elevator. However, I’m still of the opinion that I don’t want to do this with the big bike ever again. 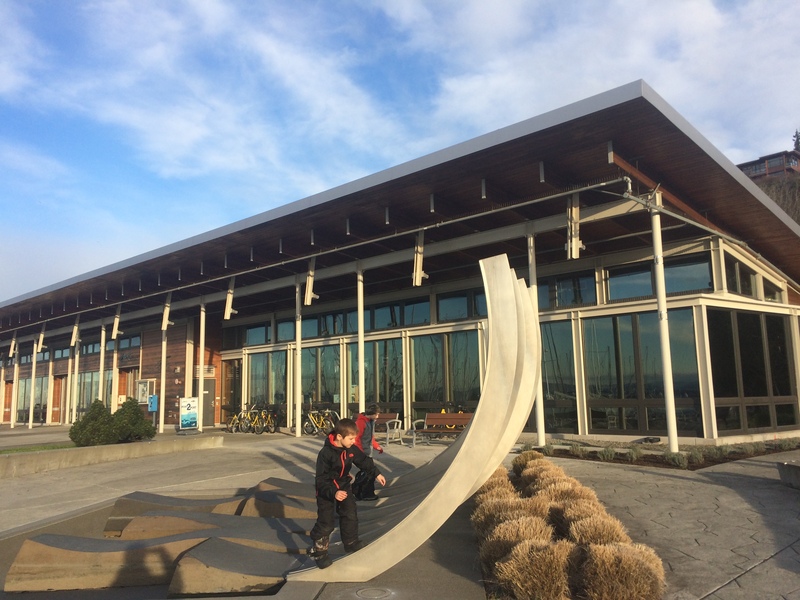 We skipped the soonest Seattle ferry to have lunch at Fritz European Fry House in Bremerton (just up the hill from the ferry terminal) and then explore the area around the USS Turner Joy. 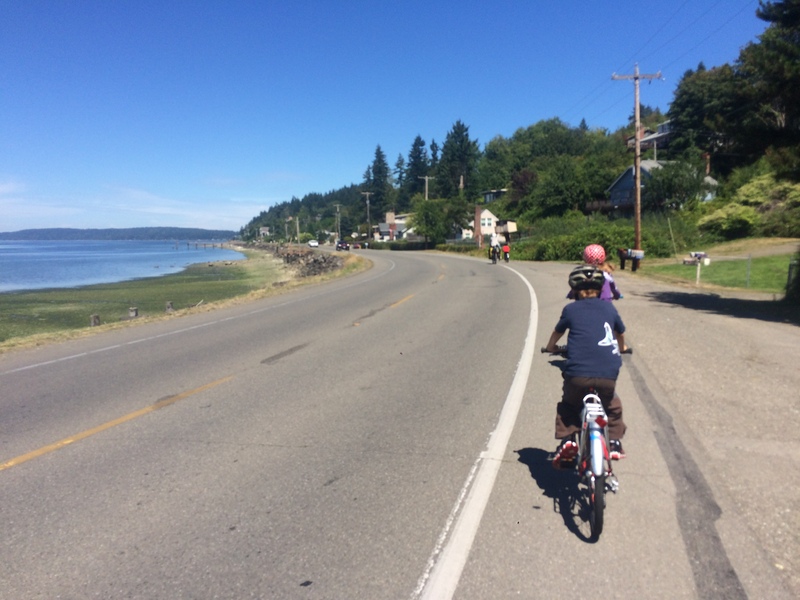 The ride home from the ferry is all slightly uphill so we took lots of water/rest breaks (and one crash/rest break), but the kids made it without complaint! Our second trip was double the fun. 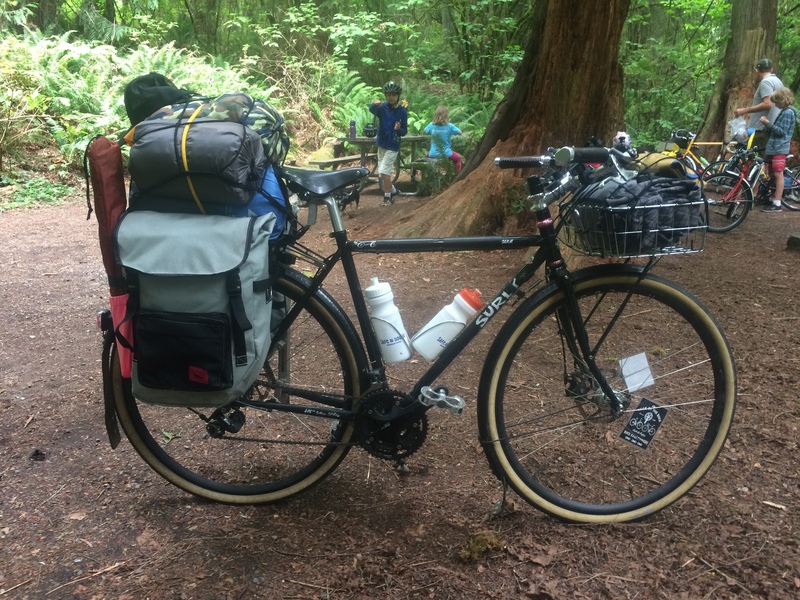 I didn’t even try to convince the kids to use their panniers and I was somehow able to fit all the stuff on my Surly Straggler. 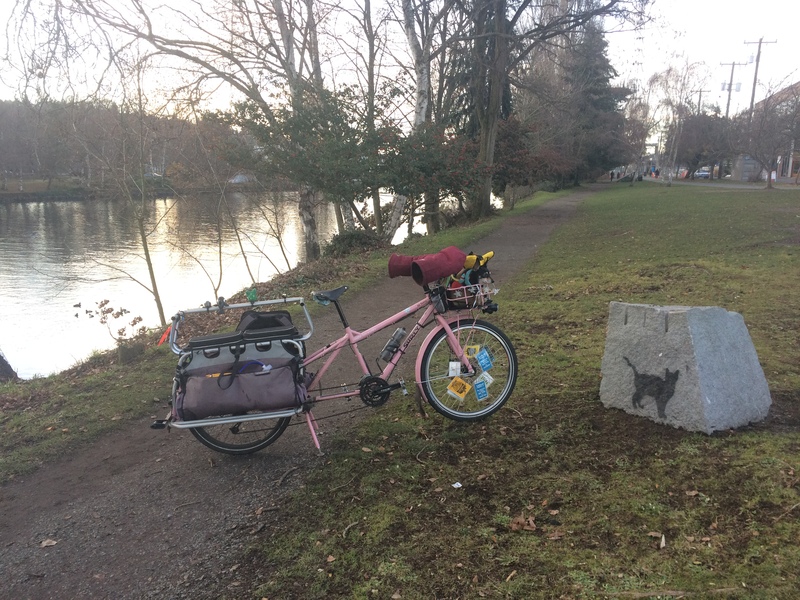 I needed my front basket for gear which meant I had to wear nine-pound Pixie in her backpack, the Timbuk2 Muttmover, which I wouldn’t want to do for a big trip, but was just fine for this short one. This time we went with Brad and his two kids, our frequent camping buddies. 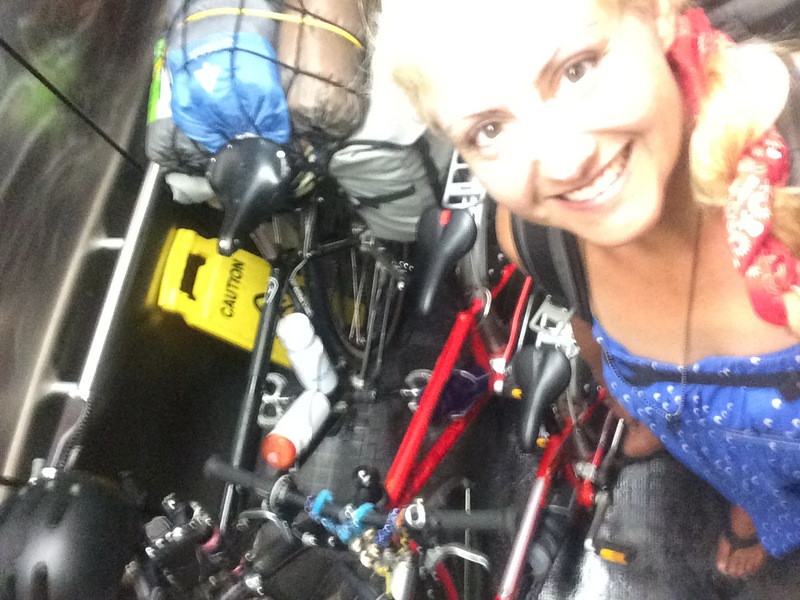 They also have a Big Dummy and a tandem plus trailer bike, but I convinced Brad to carry all the gear on his Surly Long Haul Trucker and put his kids on their own bikes so we’d all easily fit in the elevator. The elevator was so much easier like this! 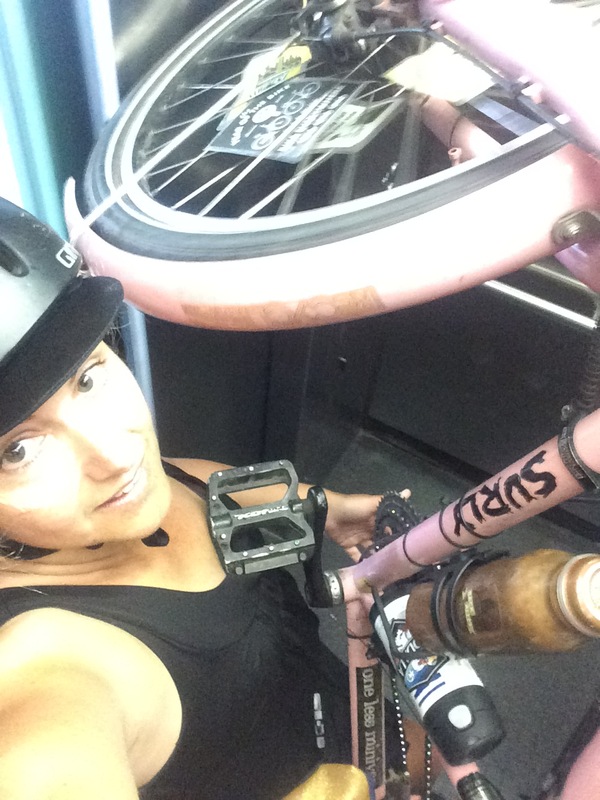 I took our three bikes in the elevator while the kids walked down the stairs. 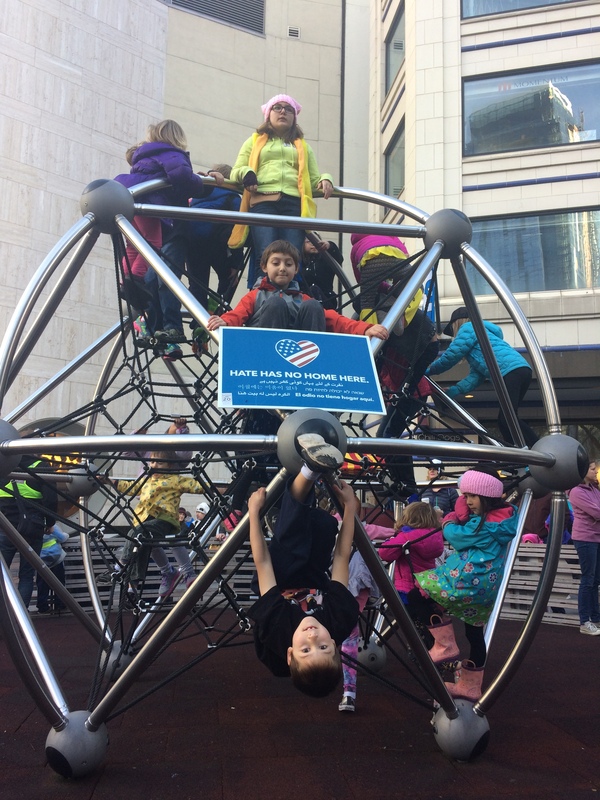 One thing that was trickier with our bigger group was the varied speeds and personalities of the kiddos. Brad rode ahead with the two speedsters (his big and my little) and I hung back with the two who appreciate a slower pace. We didn’t get too far from one another and met midway for a roadside blackberry snack. Having friends along was encouragement enough that my kids biked up the last hill–Hillsdale Road just after the camels–that they had both walked up on our first visit. This time we opted for a $25 economy spot and chose one fairly close to the beach. 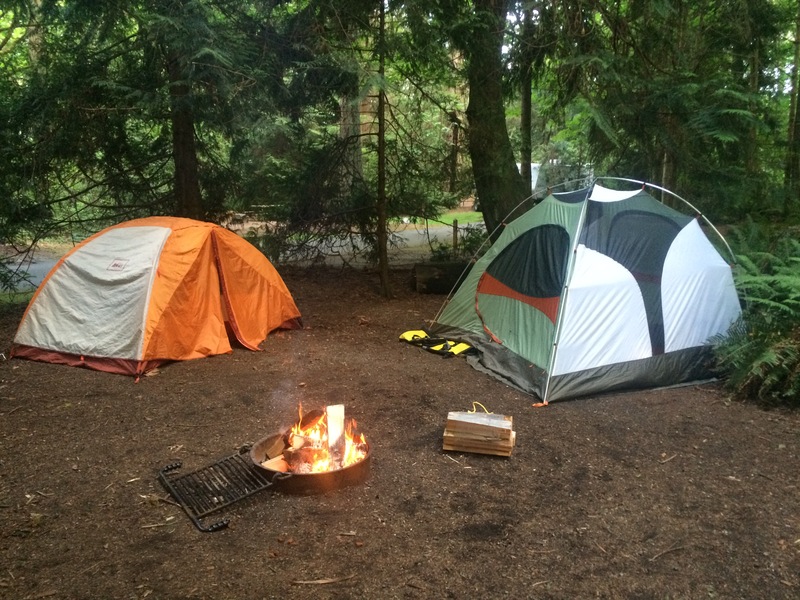 The hiker/biker spots are big enough for two tents, but we wanted a fire. We still chose to bike down rather than walk, but everything is all close together with no fast roads to cross. We ventured beyond the stinky beach to hit the tide pools. This meant biking along a gravel path and narrow trail lined with poison oak warning signs. No one got poison oak and we found tons of tiny and big crabs to play with. 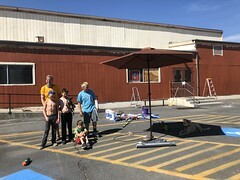 Having friends along meant we hung out at the campground for quite a while on day two–laps and laps were sprinted around the campground, a dead snake was thoroughly examined, and fellow campers were befriended. Next time I’ll try to time our visit so we can stay for two nights and [hopefully] more easily hit the road early in the day with fresh legs. 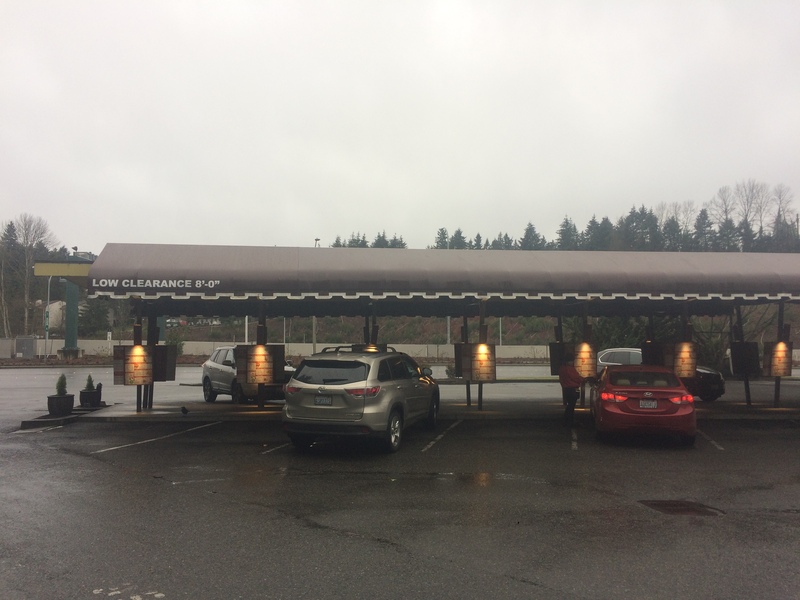 The first 90% of the journey home went well: great ride to Port Orchard, successful foot ferry and foot ferry elevator rides, tasty lunch at the fry house, and restful ferry ride back to Seattle. Once on the Seattle side we stopped to play at the beach, visited an outdoor bike commuter happy hour, parted ways with our friends, and then slowly clawed our way home with quite a few tantrums, some angry bike walking, several water break stops, and one blackberry picking session. Definitely too big a day. That said, WE CAN’T WAIT TO GO BACK! Warning: contains cars. 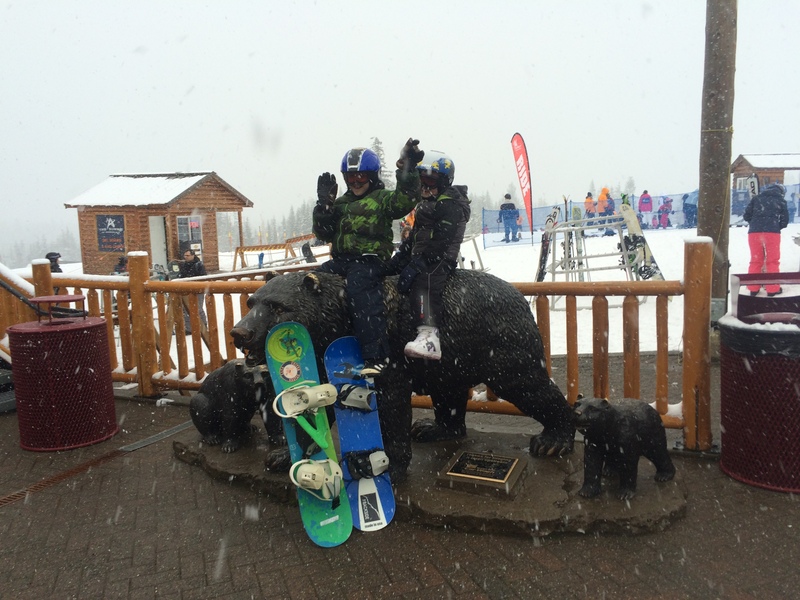 Also, no bike riding…but lots of snowboard riding. We expanded our repertoire last January when I signed up for Zipcar car sharing. This is incredibly silly, but I immediately felt more legitimately car free. Now when people get that horrified look on their faces and ask, “But Madi, what will you do if you ever need a car?” I no longer have to fight the urge to ask back “What the f–k would I need a car for?” Now I can easily say “Oh, I have Zipcar!” and I don’t even have to admit that I’ve only used it once. Zipcar is often at bike events with various discounts (and free sunglasses), but I signed up online because I can be impulsive and decided late on a Wednesday night that we should go snowboarding the coming weekend. The threatened 1-3 business days to approve my application only took a few hours (thank goodness!) and I opted to bike downtown and pick up my Zipcard in person rather than wait the 3-7 business days for it to arrive in the mail. We ended up not going snowboarding that weekend so the rushing around was for naught, but I tend to opt to pick things up rather than have them driven over to me. 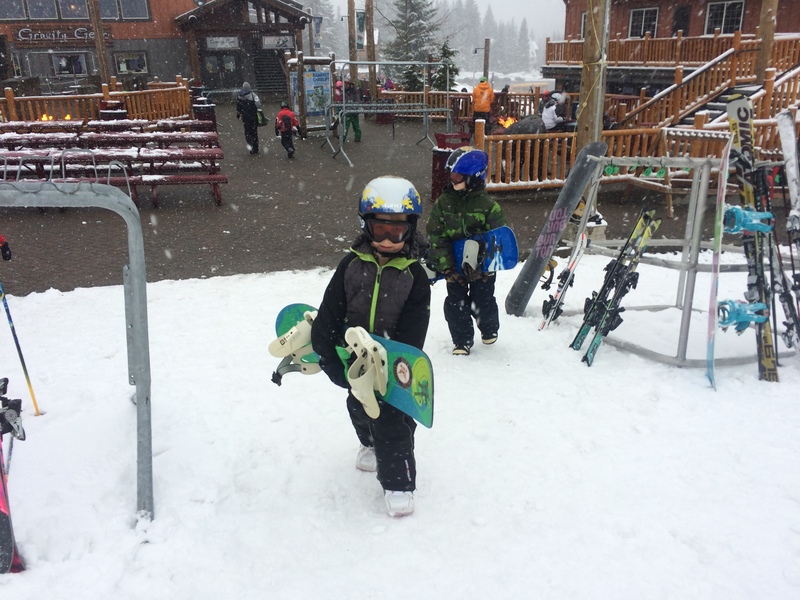 We eventually used Zipcar for the first time a couple months later for day trip to the closest ski area, The Summit at Snoqualmie, where I’ve brought the kids snowboarding a bunch of times back when I was a car owner. The snowboarding was awesome! My ability of following the Zipcar rules: not so much. Totally my fault. It’s all right there online. Plus I received an email with subject line “Your first Ziptrip – the one you always remember” that would have been very helpful had I read it carefully. So let’s talk about the snowboarding part first. Summit is an hour’s drive from home–just how I like my snow. There are four little resorts: Alpental, Summit West, Summit Central, and Summit East. We’ve tried three of the four in the past and Summit Central works best for us. 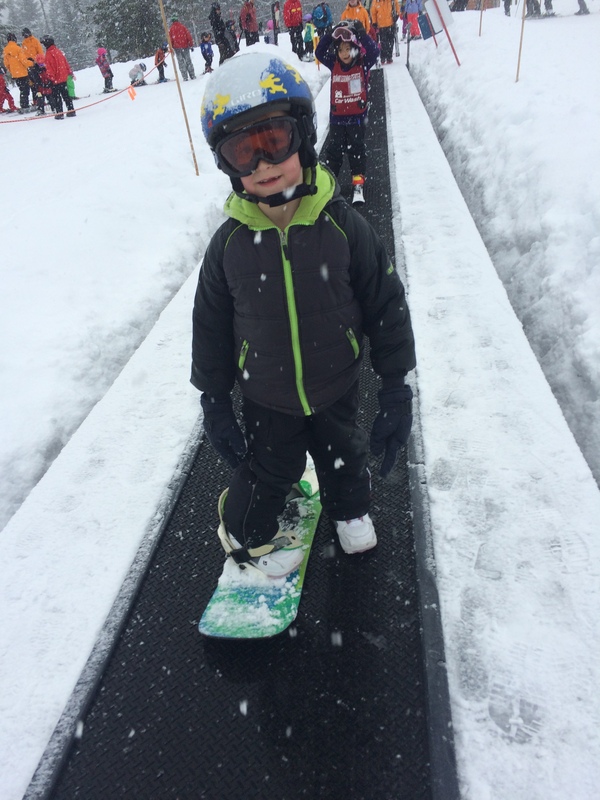 The kids use the magic carpet (the conveyor belt lift thingy) which is great for me because I don’t need to shell out for my own lift ticket–I can easily walk up the bunny slope after jogging down alongside them. This also means I don’t get to do snowboarding myself, but that’ll change as they get bigger. 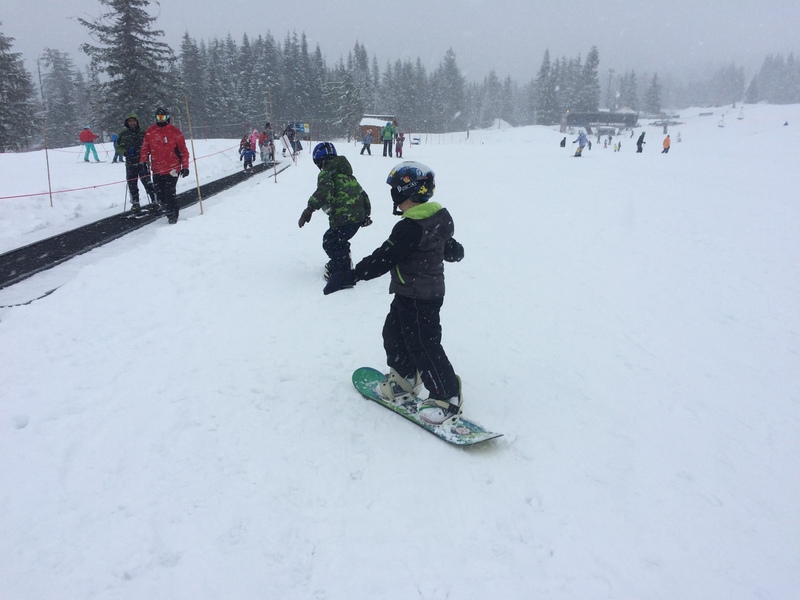 I’m not a very good snowboarder and the one time I helped my older kid up the lift and down a run in North Vancouver was really hard. I don’t think I could manage two kids. But back to Washington: the bunny slope at Alpental is a little too steep and long so I can’t keep up as I jog after the kids hollering at them to sit down before they careen into each other, the bunny slope at Summit West isn’t steep enough and I have to give them pushes every few feet to keep them moving, Summit East doesn’t have a magic carpet, but Summit Central is just right! New this year: they carry stuff! From wearing the baby on my back and carrying one kid’s gear, to wearing a toddler on my back and carrying two kids’ gear, to this! Here’s what the magic carpet looks like. Our regular lift operator back in the frequent weekday visit days used to let me stand on it to ride back up, but it’s easy enough to trudge on either non-moving side. Zipcar oopsie one: I forgot there’s a gas card! I used my credit card to fill the tank (had I asked for a receipt, I could have been reimbursed). Doh. Regular rental cars come with full tanks, but Zipcars don’t. This might be enough to dissuade some renters. Zipcar oopsie two: I LEFT THE ZIPCARD AT HOME AND LOCKED US OUT OF THE CAR IN THE SNOW AN HOUR FROM HOME! Thank goodness for modern technology–they unlocked it remotely over the phone. One checked out a Zipcar by holding the Zipcard near a sensor to unlock the door; the key is very conveniently zip tied to dangle near the ignition. So the key stays in the car and the card [ideally] stays in one’s wallet. Zipcar oopsie three: I didn’t realize I had to tap my Zipcard on the sensor upon returning the car. This is mentioned on the website and in the helpful-if-read email, of course. Fortunately, I went online to see if I could let Zipcar know I’d returned the car two hours early in case someone else wanted it, so I read about tapping out before it was too late. Despite all the problems of my own making, it was a great experience and we’d do it again. I don’t want to tempt fate and say I’ll never make a Zipcar mistake again, but there’s a pretty good chance I won’t repeat these specific mistakes. Zipcar isn’t the cheapest way to get a car for the day–it’s really best for an hour or a few hours–but it’s definitely the most convenient for us. There are a couple Zipcar spots a couple blocks from our house, and another set 10 blocks away. 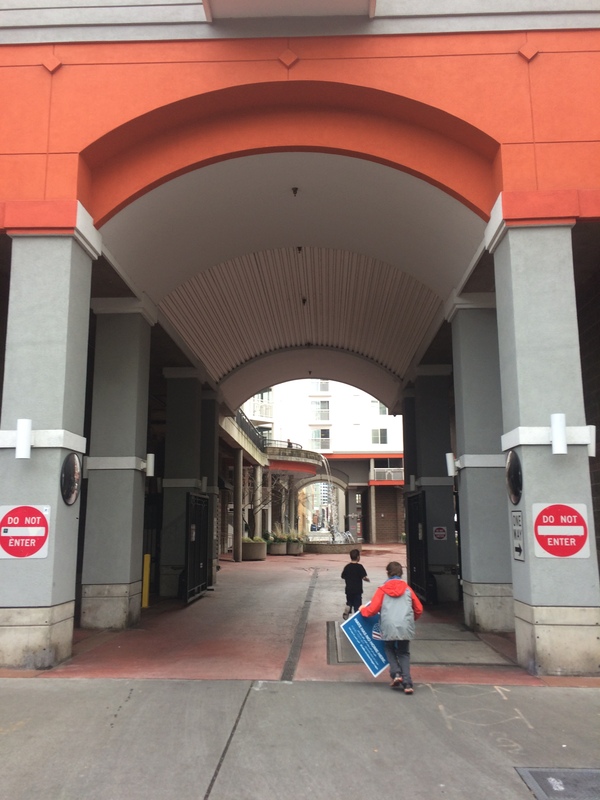 Two traditional car rental places (Enterprise and Budget) are an additional 10 blocks farther. 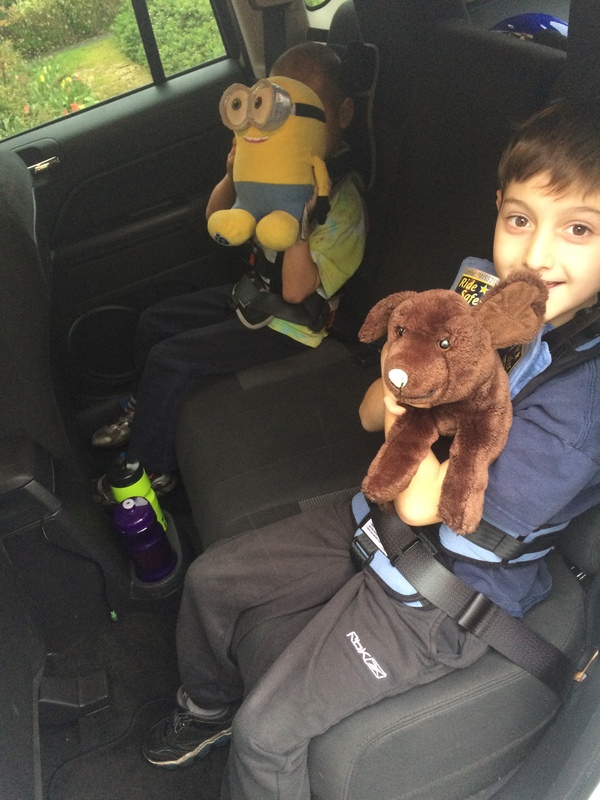 Convenience is key when you’re traveling with kids. I figured as long as Zipcar was cheaper than three $40 ski shuttle tickets, it was an acceptable price. 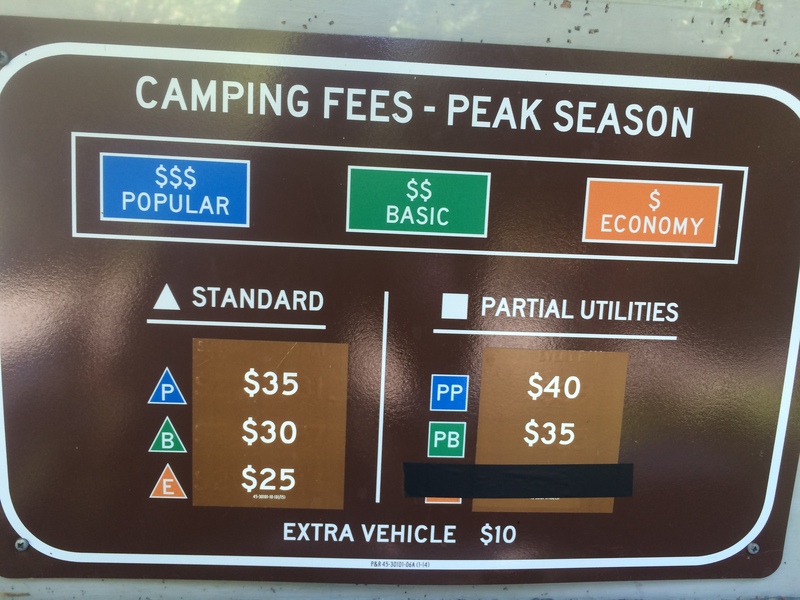 The daily rate for the car we rented was $73 (total with tax was $85). That price includes 180 miles and we went 115 miles. Note: It looks like the Zipcar spots closest to our house aren’t there anymore (per the website, I’ll have to bike by to look for sure) so there’s a good chance I won’t renew my membership. Bummer. Lugging regular car seats around is a pain. That’s why I got RideSafer Travel Vests when I went car-free, following in the footsteps of Dorie from Hum of the City and Elle of Tiny Helmets Big Bikes. They are as safe as traditional car seats (with a price tag to prove it), but back when I got them, they were for use in taxis, rental cars, and car share, but not in one’s personal vehicle. However, I don’t see that mentioned in the RideSafer FAQ so I think they’re approved for us all the time now. They’re lower than car seats so the kids don’t have as good a view and I’ve heard that they’re uncomfortable for very long trips. If frugality was more important to me than convenience for this once-a-year trip, I’d use one of the car rental places 1.5 miles from our house. Honestly, I’m not sure how I’d easily manage that on a weekend. For a weekday one-day rental I’d grab and return the car while the kids were at school, but I’m not sure how I’d get us all there (or especially how I’d get us all back after a long day of snowboarding). Peeking at pricing, SUVs (which is what we used from Zipcar) are more expensive at both car rental places, but smaller cars are a lot cheaper. An economy car would work fine for the two kid snowboards. Dealing with office hours would be less convenient, though, and probably mean we’d keep the car overnight the day before or after hitting the mountains. I mentioned the $40 round-trip shuttle bus, Seattle Ski Shuttle, above. Last year they departed from REI if I remember correctly, but now they leave from a hotel. I had planned to try it out myself first before subjecting the kids to a super-early wakeup. The bus leaves at 6:30am and it takes at least half an hour to bike there with a snowboard on the Big Dummy, and longer if I’m also carrying kids. I think I might still try this on my own this winter because Zipcarring alone doesn’t seem worth it. I really doubt I’d do it with the kids. They wake up too early for my taste many days, but to be ready to leave the house with snowboarding gear before 6am is a whole different realm. The Summit has some great resources listed on their Carpools and Shuttle Services webpage. More? If you know of other ways to get to the mountains, I’d love to hear them! Happy New Year! 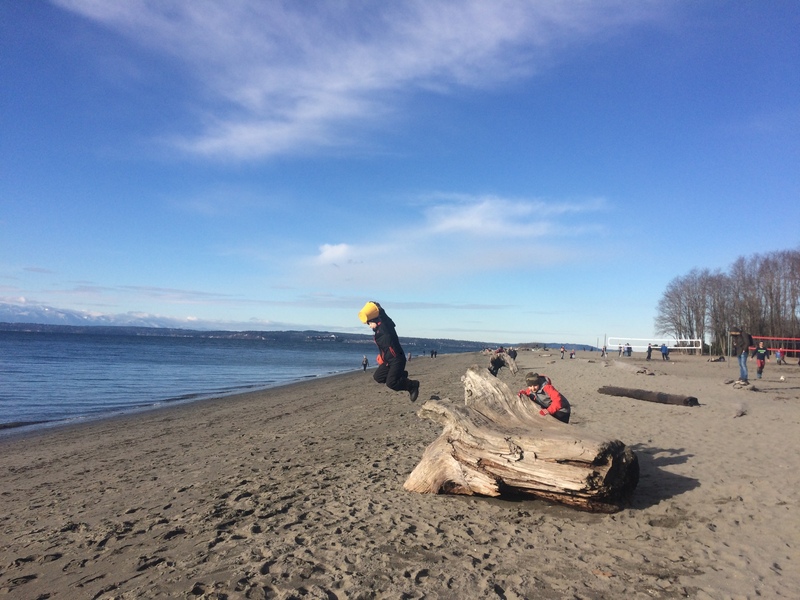 We celebrated the last day of winter break with a bike ride to the beach. It was a couple degrees above freezing (brr! ), but the sun was out and the kids wanted to collect seashells. I more or less bundled us up in snow gear: the kids wore snow bibs, snow boots, combo sweater/jackets, gloves, and caps under their helmets. One kid started out in his balaclava, but changed his mind. PRO TIP: call balaclavas “ninja masks” for better chances of kids wanting to wear them. I don’t own warm base layers for them or wool socks, but they did OK with cotton under all of that. I wore snowboarding pants over cotton leggings, wool socks and boots, thin merino wool long-sleeved shirt and merino wool sweater, and cap under my helmet. Pixie wore her thickest sweater and has a warm liner than goes inside her basket bag. And I brought a bit of backup stuff along: extra set of gloves for the kids, thick gloves for me to wear while at the beach (my bike was wearing its Portland Pogies handlebar mittens so I went gloveless on the way there, though had I been more organized, I would have worn thin cotton gloves), snowboard jacket for me at the beach and on the way home, balaclavas for the kids in case they came to their senses, and two HotSnapZ reusable hand warmers. Like most of our bike excursions, the journey is just as much (and sometimes more) fun than the destination. The kids chirped “Happy New Year!” at all the dogs we biked by on the Burke-Gilman Trail, I got to say, “Hey, cool bike!” to a bunch of kids, and we watched a guy in a sail boat taking photos of the Fremont Bridge as it opened for him to sail under (but he didn’t hear us calling “Ahoy!” at him). 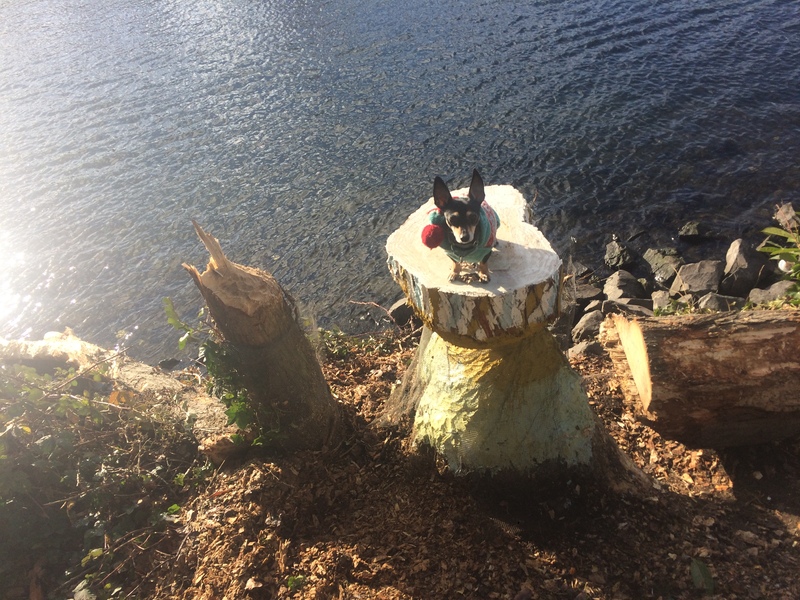 We stopped for a water break along the ship canal and discovered a heart-shaped tree trunk! 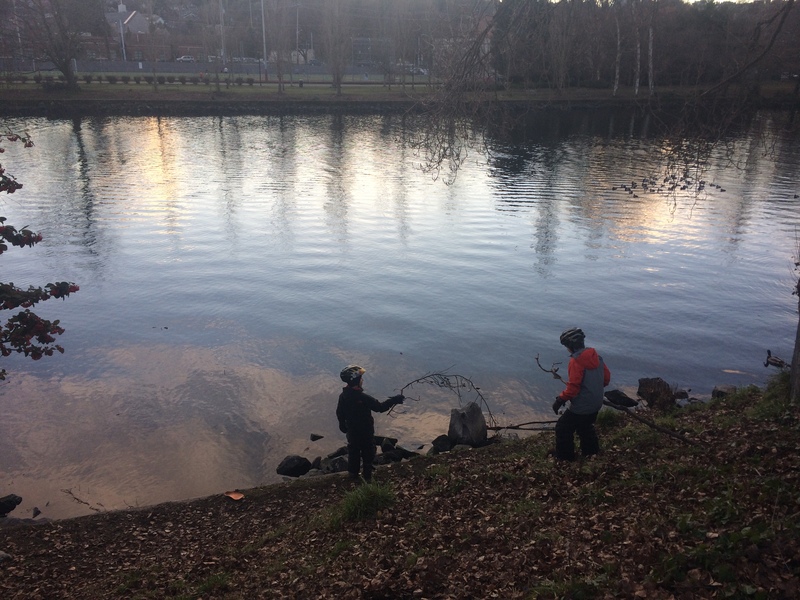 The kids threw sticks into the water for a little bit and could have gone on forever, but Pixie attempted to roll in something stinky so I packed us up and moved us along. I was surprised to see so many people at the beach. Coming out on a cold day like this was a BIG DEAL to a wimp like me, but these real Pacific Northwesterners are very hardy. We met a fellow Big Dummy owner visiting from Arizona–he must have been freezing, though he didn’t look it. The one thing I have yet to figure out is how to time things so the kids don’t get hungry and want a snack five minutes after we’ve left the house. I’m pretty sure it’s impossible because they ate a huge breakfast right before we left. I was able to get us all the way to the beach (with one water stop and one rest stop) before we had a snack and were able to last a couple hours at the beach. 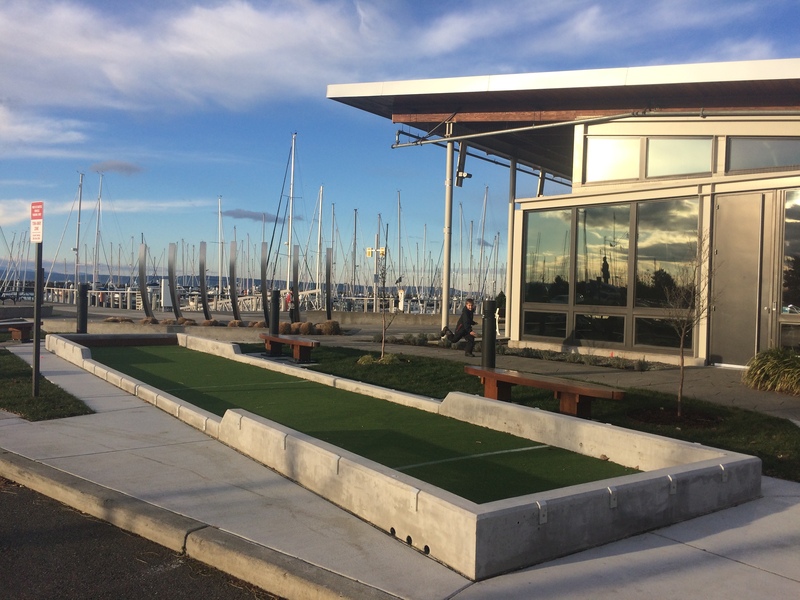 I had noticed a new-to-me cafe, Jibe Espresso Bar on our way over so we stopped there on our way home and discovered that the Shilshole Bay Marina is AWESOME! 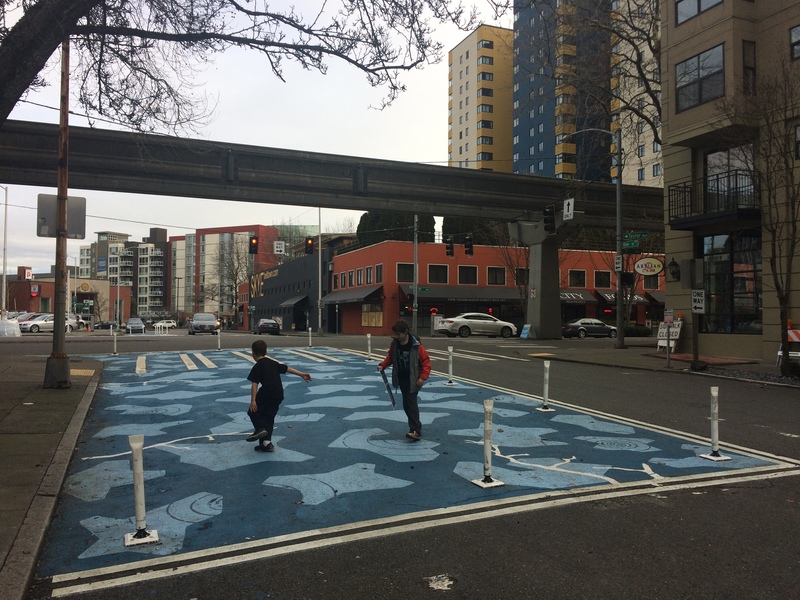 It’s across a busy street from the Burke-Gilman Trail, but one can stick to the sidewalk of Seaview Avenue for half a mile to avoid that. but it was pretty great even for a day like today. The cafe didn’t have restrooms so we walked to the main entrance (just two doors down) and discovered a great area to hide from cold and/or rain! There were restrooms, drinking fountains, and a warm, dry area for snacking (because eating at the cafe wasn’t enough, of course). 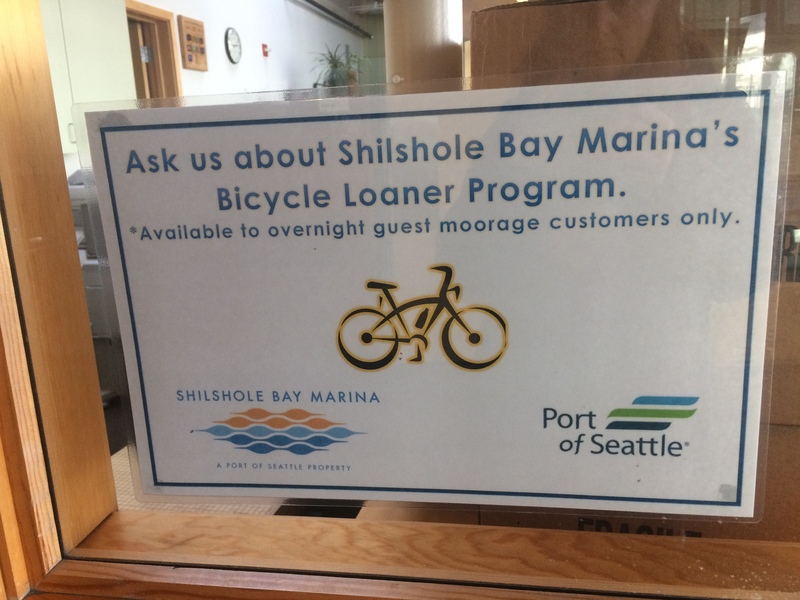 I also saw a sign for free loaner bikes. Not that we’ll ever be overnight moorers, but that makes the place that much cooler! 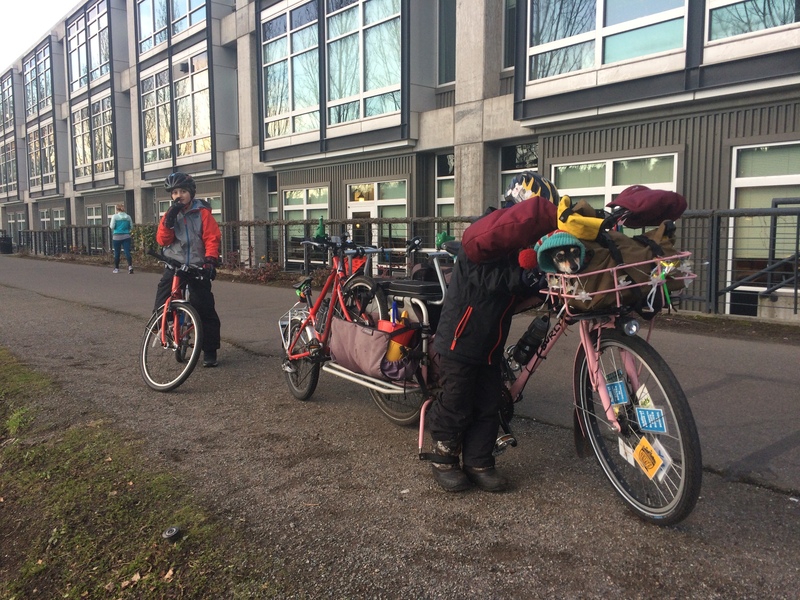 The bikes are yellow and clunky, but they all have rear racks and it’s flat all around here. So they’re perfect! The kids warmed their hands with the HotSnapZ while I unlocked the bikes. The heat packs are a bit big for shoving in gloves or boots for use while riding so I haven’t yet figured out my favorite way to use them, but this worked well. Heading home was an adventure, too. My seven-year old started getting tired so we took a rest break at Kitty Cat Rocks. There are a couple rocks recently painted with cats alongside the Burke-Gilman Trail that we’ve never bothered to stop at before, so it was exciting for all of us. Even Pixie thought they looked very authentic. The kids threw sticks in the water for a bit and it was perfect. 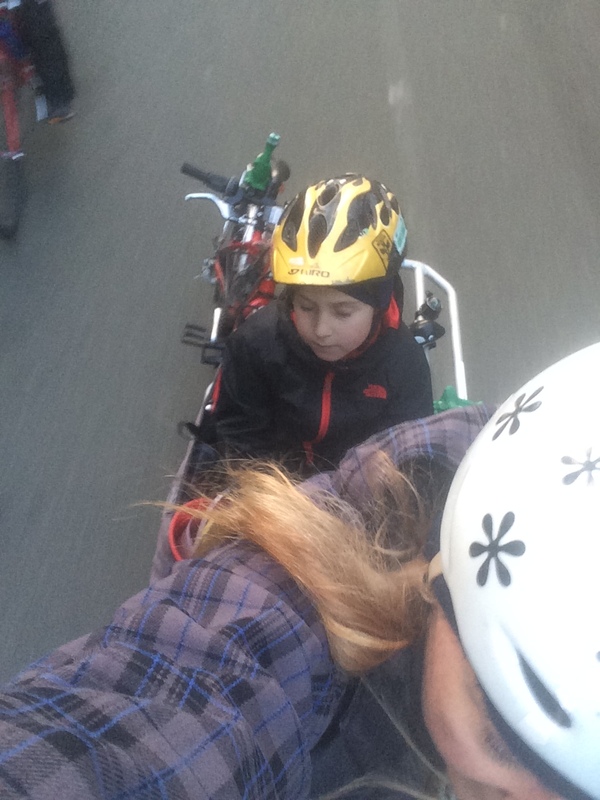 Just when I was patting myself on the back for having weaned the kids from needing (and myself from offering) rides on the Big Dummy, my littler dude said his poor sore back couldn’t take it anymore. Of course at first I said, “Hmmmm perhaps your back wouldn’t hurt had you listened to me about not bunny hopping with a sore back,” but I’ll happily tote him the last couple miles home lest he change his mind about loving bikes. So I popped his bike into the Xtracycle FreeLoader bag and he climbed aboard the deck. But really, I rarely carry the kids these days, though I will continue to drive the Big Dummy just in case I need to carry one or both of them and their bikes. 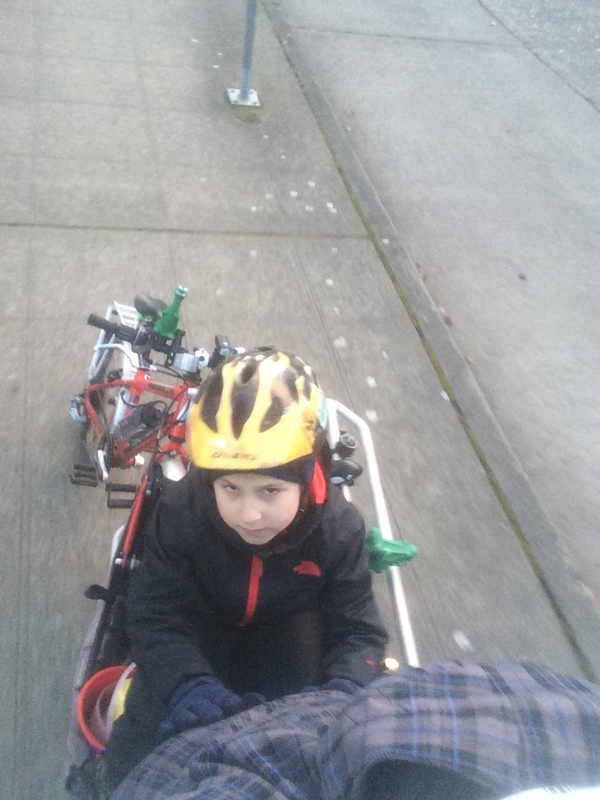 Fortunately he woke up just in time for the big hill to give me a “Jedi Push.” The Jedi Push is when you push against the back of your pedaling parent and use The Force to help propel them up the hill. It totally works. Here’s to lengthening days and lots of biking. Happy New Year!